Tight on time? The Heart of Ireland in 8 Days — Rick's personal "best of" distillation of our two-week Best of Ireland tour — starts in Ennis (just down the road from Shannon Airport) and ends in Dublin. Each day along the way, in the good hands of your Rick Steves guide and local experts, you'll be amazed at all you'll experience in a mere week of touring the Emerald Isle: must-see historical sites, charming towns, music-filled pubs, artisan visits, and walking tours — including the Rock of Cashel, the Cliffs of Moher, Adare Village, Dingle, the Great Blasket Centre, Kilkenny Castle, Glendalough, the Brú na Bóinne archaeology site, crystal cutting, whiskey tasting, and more. Join us for the Heart of Ireland in 8 Days! Sale! Save $300 on new bookings! We'll gather together at our hotel at 2 p.m. for a meeting, then take an orientation walk around Ennis, beginning with a tour of its friary. Afterward we'll get to know one another over a hearty "Welcome to Ireland" dinner together. Sleep in Ennis (1 night). No bus. Walking: light. After breakfast, we'll pack up and board our comfy bus, setting course for Ireland's Dingle Peninsula. En route we'll stop to visit the dramatic Cliffs of Moher, where you'll find yourself leaning into the wind, teetering on the very edge of Europe, more than 600 feet above the churning waters of the North Atlantic and County Limerick's lovely village of Adare. At the end of our drive we'll arrive in the pastel-painted, quintessentially Irish harbor town of Dingle. After a walking tour, we'll enjoy a gourmet dinner of local specialties followed by an evening of Gaelic tunes. Sleep in Dingle (2 nights). Bus: 5 hours. Walking: light. It's a great day to experience some of Europe's wildest natural beauty and most ancient Christian sites. We'll start our day with a crystal cutting demonstration from a master craftsman, then hop aboard our bus with our local expert to follow the famous Slea Head Drive, our vote for the most beautiful road in Ireland. We'll stop to tour the strikingly situated Great Blasket Centre, where we'll get a close-up look at the language, literature, and daily life of a traditional Gaelic Blasket community. The remainder of the day is free for you to soak in more of Dingle's charms and enjoy dinner on your own. Bus: 3 hours. Walking: moderate. Today we'll bid goodbye to Dingle as our bus transports us across the Emerald Isle. On our way we'll stop to tour one of Ireland's most historic and evocative sights: the Rock of Cashel. St. Patrick himself was here more than 1,500 years ago, and ever since, the Rock has been the spiritual heart of Ireland. From the craggy remains of the cathedral and castle to the views stretching out across the Plain of Tipperary, this is where the Irish in you will stir from head to toe. Upon arrival in Kilkenny, we'll meet a local guide for a walking tour of the medieval town center. Your evening is free for dinner and traditional music in one of the many atmospheric pubs. Sleep in Kilkenny (1 night). Bus: 5 hours. Walking: strenuous. This morning we'll visit Kilkenny Castle, a symbol of Norman occupation since the 12th century. After a walk through its restored Victorian interiors and extensive parklands, we'll head further back in time with a visit to Glendalough, Ireland's most impressive monastic settlement. We'll visit the iconic Round Tower, ruined churches, and the lakes that give Glendalough its name. Then we're off to Dublin, where we'll get oriented and enjoy dinner together. Sleep in Dublin (3 nights). Bus: 4 hours. Walking: strenuous. Today we'll drive an hour out of Dublin to one of Europe's premier archaeological sites: the ancient tombs of Brú na Bóinne. Predating Stonehenge by a thousand years and the pyramids at Giza by 500, these massive "passage tombs" of Newgrange and Knowth are windows into a mysterious, pre-Celtic Ireland, just as it was pulling itself up and out of the Stone Age. This afternoon we'll return to Dublin to tour Glasnevin Cemetery and Museum, the final resting place of more than one million Dubliners, including many of Ireland's national heroes and heroines. Tonight we'll compare notes and celebrate our marvelous week together over a farewell dinner. Bus: 2 hours. Walking: moderate. Breakfast is provided, but there are no group activities today. You can fly out of Dublin's handy airport, or for those not ready to return home yet, Dublin is a great jumping off point to Paris, London, Amsterdam, and many other exciting destinations. Your guide will help you with any post-tour planning, leaving you well prepared for the road ahead. Slán leat! Carry/roll your luggage over uneven pavement (several blocks possible) and up stairways to reach your hotel, then up several flights of stairs to reach your room. Navigate cobblestones and difficult terrain at ancient sites. Knowledgeable, interesting, entertaining, good story teller. "Was not on the tour. Went to hear Donna Taggart concert. She was amazing." The directions from the bus stop in Ennis to the first hotel could have been more descriptive. Maybe mentioning that it was directly across the street from a very, very tall church? After flying all night & very tired, it was so great that the Old Ground Hotel allowed us to rest in their lobby & had us checked into our room by 10:30am. So nice and appreciated. We absolutely loved the towns and smaller cities more than Dublin. "Glendalough. The bus ride to it had us wondering what was so important to see. This was impressive, and so great to see that it was preserved so well. That old cemetery was neat." "I think it was seeing the book of Kells...I had been to the Isle of Ilona on my RS tour of Scotland...and to have been where the book was written and then to see the book, it was like all the dots connected...my journey had come full circle..."
never a dull moment, saw very beautiful countryside and stunning local landmarks that I had never seen nor heard of before. learned Irish history that until then had been sort of vague. traveled with a great group of people and with a guide who worked non-stop to see that the tour was a success. sparked my interest in Irish history,from prehistoric time to the present. "I think my "wow" was learning the history of Ireland and all that we did, and saw from the tour guide and the local guides. the guides were a wealth of information,sharing stories with interesting facts and humor, and most important, they firmly believed in what they did, the facts and stories they relayed, and their love of their land,past and present"
As my first tour, I was unsure what to expect. But this tour was fantastic,. U saw incredible sights, heard information that I had not heard before, and had accommodations that were very nice. Overall experience was incredible. "It is hard to pick one "wow" moment as every day brought new and exciting sights and experiences. From the cliffs to the castles and churches, all was fantastic. I enjoyed the night events and all the beautiful scenery." Good group, Great guide and Ireland was much more interesting then I thought. "Newgrange and the Dingle Peninsula"
This was my 7th RS Tour and one of my favorites. A really great tour group. Although we didn't have as much free time as some of the other tours, there isn't anything I would have wanted to skip just to explore something on my own. Pascal is an amazing guide and his knowledge of Ireland's history, culture and politics made for a truly memorable experience. I learned so much. Plus his stories still make me laugh. Our driver Michael was wonderful and along with Pascal made a fantastic team. "Every single day seemed to be a "wow" moment. Loved Dingle and the visit to Newgrange. The Book of Kells was amazing. Also our visit with Billy Keane was very fun. He was delightful." This was our fourth RS tour and did not disappoint. Ireland is charming and we really enjoyed the mix of activities. Ennis was a good place to start since we needed to be accessible to airport or train. Dingle was awesome, Kilkenny could be missed although we do need a stopover before Dublin. We loved Dublin and stayed there an extra day. Pascal and our driver Michael were both outstanding, bus time is always enjoyable when the guides have such great stories to tell. "The Slea Head loop drive and the Irish music night in Dingle at the pub come to mind. Many more, the passage tomb was thought provoking, I was surprised we got to actually go inside." Everything was wonderful, especially the tour guides and the food. I loved the town of Kilkenny. We had a great tour and outstanding dinner. We just wish the hotel was better. We had the room that was farthest from the entrance, up and down many staircases. It also had the most uncomfortable bed. If you could find another option in Kilkenny that would be my suggestion. "There were two wow moments. The top experience for me was Bru na Boinne. How amazing to get to enter the tomb that was built 5000 years ago. The second wow moment was holding the birds in Dingle. Very cool!" Another homerun by RS Tours. The range and number of activities was perfect for a tour of this length. It was a great value for the price. I learned so much about Irish history, culture, and politics. As RS hopes, I returned home exhausted so it must have been an excellent tour! "Meeting Billy Keane and hearing first hand about John B. Keane's life and work as a writer. I'm a fan of John B's "the Field" so this was very special. Billy, himself, is charming, interesting, and witty...a journalist and writer. It was an utterly delightful couple of hours. A close second has to be Bru na Boinne and being able to actually enter a tomb that was built before the Pyramids." This was my first Rick Steve's tour and I loved it. The 8 days Heart of Ireland tour was fun, active, informational and educational. I loved learning so much about Ireland's rich history! The group my husband and I were with were fun and friendly. Our guide, Pascal was outstanding! He was fun, looked after all our needs, extremely knowledgeable and had an excellent sense of humor. Michael, our bus driver was fantastic too! He was obviously very experienced and took good care of us. "Standing inside the tomb at Newgrange watching the light creep in and light up the whole place. Knowing that it was built 5000 years ago is mind boggling!" I thoroughly enjoyed this tour. This was my 3rd Rick Steves tour, and as always, what made this tour great was the unique and well thought out sites to visit, knowledgeable tour guides, and the fantastic group of traveling companions that come to be friends over the length of the trip. We learned a lot about Irish history, we laughed often, and we lucked out with fantastic weather. "There were many "wow" moments on this tour such as the fantastic views from the Cliffs of Moher, and the Rock of Cashel, standing under the Viking ceiling in Kilkenny Castle, walking the wooded paths at the monastery in Glendalough, and watching the light pierce the tomb in Newgrange. Along with this were the unscheduled surprises that added unique experiences like the storytelling at the John B. Keane Pub, music nights in Dingle, and the whiskey tasting in Kilkenny." This was a great tour with a tremendous guide. Pascal gave us a real understanding of ireland's History and culture. I'v Already recommended it to a friend. I have to count this among my favorite Rick Steves tours! From the awesome guiding by Pascal, to the incredible driving skills of Michael, this was a truly cohesive and fun group. As the only person on the tour who didn't know someone else, I was a little concerned at the beginning. But I was "adopted" and was never alone for meals. We saw so much - a lot was packed into 7 days! I definitely feel like I got my money's worth. I've been wanting to see Ireland for a long, long time. "It's hard to pick just one. The Cliff's of Mohr were awe inspiring and it was SO windy! I didn't have a good hair day the entire time we were there :-) I also really enjoyed the Rock of Cashel - it was our lone sunny day and the ruins looked stunning against the bright blue sky. And I can't forget the Falconry - an amazing experience!" Very well thought out tour with enough activity and interesting sights to completely fill 6 days,but maybe a little rushed. There is not much time to explore additional interests like we had in Italy and Scotland. The first and last day are not really "tour" days, since one is a later day meet and greet with brief walking tour, and the last day is only breakfast. I know you have a 14 day tour, but maybe you could consider a 10 day tour which would essentially be 8 days. Think about it. "I think the Book of Kells and library. Astounding to see such history preserved." Ireland was beautiful. Guide (Stephen) was wonderful. please skip the dolphin harassment tour!! it was awful. Dingle would have been more enjoyable if we didn't arrive there during the food festival. Seems that would be a weekend to avoid. I feel we missed out. Hotel in Kilkenny was tired and worn and dirty. Local guide (frank) was rather 'off color' in his jokes. Bus driver (Pat) was great. "Dingle peninsula was beautiful as was Glendaloch." The tour was great fun and the group was very easy going and cooperative. I appreciate the "no grumpy" rules Rick Steves announces in the beginning. The weather was perfect! Thanks Stephen for arranging that! "Loved Dingle and the Milltown House. I would have liked to spend more time there, perhaps on another stay! The Falconry was superb! Also loved the Great Blasket Centre. It was very moving." Tour was fantastic. Saw so many great things that it's hard to remember then all! Fun group to travel with too. Stephen McPhilemy was the best tour guide in the world! He kept us entertained with stories, songs (yes... we sang on the bus! ); and recommended local restaurants (yum), entertainment and places to shop. He gave the tour that extra touch! And Pat the bus driver was super! He had a few jokes/stories too! "The surprise Falconry Experience with Eric at the Milltown House B & B in Dingle. The birds were wonderful, lovely, and what eyes! So glad I had the courage to let them land on my arm! What a memory!" I attended the tour with my mom, sisters and aunt. We had a great time and our guide Stephen took it to the next level! He is very passionate about Ireland and it shows on the tour! "The Cliffs of Moher was very beautiful!" We had taken the longer Ireland tour in 2010, so were very happy to find we had Stephen as our guide again on this trip. We got to see some places we hadn't visited before, and got to go back to Dingle again (one of the main reasons I wanted to take this tour). I was happy to get back to Ireland and enjoyed this tour very much. "Always hard to pick out one moment, but I have to say it was the Falconry Experience at Milltown House in Dingle. I didn't know what to expect, so was delighted and surprised to watch Eric's demonstration with his birds. They are amazing." In our case we revisited several places we had seen before. Of course we learn more each time. This was our second tour with Stephen, and I was more impressed than ever at his broad knowledge of so many subjects both in and out of Ireland. I consider myself a critical individual, and I have not always been charmed with the guides, but he is one of the best. "The stay at Milltown House, enjoying the Wolfhounds, holding an eagle on my arm, and enjoying the relaxed atmosphere. Dingle Falconry put on a most impressive show. I never anticipated holding an eagle on my arm." This was our first vacation trip to Europe and first Rick Steves' tour. It was a wonderful experience. If we had done this on our own, I do not think it would have been nearly as good. Having a good guide is the essential key in my opinion. I was concerned about whether I would have any problems since I am 73 years old, but all the walking was really easy and I am in relatively good shape. "I especially liked the falconry experience in Dingle. I have read books where falconry was included and just seeing how well the birds were taught in person was something I will not forget. Holding the Golden Eagle and the Harris Falcon was exhilarating. The falconer himself was very informative." Stephen was excellent by explaining Irish history while the bus was moving from point to point. Irish history is full of conflict and his explanation put it in perspective. This made each site we visited that much more meaningful. We new the back story upon arrival. "The castle of Kilkenny restored to its former glory, esp. the library." The tour exceeded my expectations. The itinerary was very well designed and truly did capture the heart of Ireland. I had read a lot about Ireland before the tour so I enjoyed seeing and experiencing what I had been reading. The number of people on the tour was perfect and allowed us to spread out more comfortably on the bus. The hotels and food were great, and I especially enjoyed staying at the B&B Milltown. The tour allowed me to experience Ireland, not just see the famous tourist sites. "There were so many wow moments it's hard to pick just one. What stood out the most for me were the outstanding tour guides. Stephen was very knowledgeable about the country, history etc., and he brought the country alive with his commentary,anecdotes and songs. All but one of the local tour guides were great too. The bus driver Patrick was fun too, and it was amazing to see him navigate the narrow crowded places he had to take the bus." What a great tour! I really enjoyed having Stephen as our tour guide, as he made it fun & interesting for all ages! Patrick our bus driver was top notch & made the trip for us a great one!! "I loved Dingle, the small town feel like home! The hospitality at Stephen's place & the small local establishments." My wife and companions had just completed a Scotland tour hosted by your company and we were a "we bit" fatigued. This Ireland tour was really special and we thoroughly enjoyed ourselves. Your guide was a wonderful tour leader - one suggestion for improvement is to include much more music during the lengthy bus trips. "There were several and it's difficult to name just one - perhaps the hawking event or the visit to a music event in Dingle during their food weekend festival. The bed and breakfast at Dingle was also a great delight. The group dinners were also very enjoyable and the visit to see the book of Kells was also a highlight"
It was a wonderful experience. Lisa was an excellent guide and really helped make the experience enjoyable. She is very personable and very knowledgeable, a great combination. "Driving through the Dingle peninsula and seeing the beautiful landscape." This was my first "Rick Steves" adventure and I was not disappointed. It was everything I thought it would be. What I great group we had. "Seeing the Cliffs of Moher. It was the "a hah" moment of the trip." We had just finished our London tour with Rick Steves, and we were pretty tired. However, this tour starts out much slower and there was bus riding where you could relax and enjoy the scenery. So, they blended well together. Since Dublin was at the end of the tour, we were ready for the "city" again. The people on the tour were very nice and friendly, and the Irish people were so welcoming. On the whole, it was a fun and memorable time. "I was definitely "wowed" by the Dingle Peninsula. We did a nice variety of activities there and the scenery was beautiful. After a fun day we were sitting in the pub, enjoying a beer, and listening to Irish music and I really felt transported. I was equally wowed by the scenery and walk up to the lake at at Glendalough. We had a perfect day, and I wished we could have stayed longer." Well organized. Appreciate the comprehensive instructions on directions to the hotel and "need help." Lisa was a great tour guide. Liked the activities, and that no add on costs for activities. "Visiting the Bru na Boinne." Wonderful experience! Loved the variety with the small towns and beautiful countryside compared to the city rush of Dublin. We had an exceptional guide. She was pleasant and engaging, inclusive and fun. She helped make the tour great. Loved the Cliffs of Moher and Glendalough especially. Also enjoyed the tour of the grave site in Dublin. It was a superb experience - so grateful for the opportunity. Also so blessed by the other participants - lovely people! "Loved our final meal together with the Irish storytellers and musicians." The tour surpassed my expectations. We learned and experienced much more than I could possibly absorb and it left me with a desire to learn more about Irish history and culture. This was our first Rick Steve's tour and my first trip to Europe. I was very happy with the overall experience and felt that we had a great trip. From the hotels to the meals to the itinerary and especially our guide everything was terrific. "I enjoyed the entire trip and again because this was my first trip to Ireland Each experience was a wow moment"
We had one of the most easygoing groups I have ever traveled with. No latecomers, no complainers, no divas...generally delightful. The locations were stunning and the food sublime. Even the weather cooperated most days. "We were enjoying the boat ride to find Fungie in Dingle Bay and he did not appear for a while. The sunlight on the cliffs was just beautiful and then the captain cut the boat engines and Lisa introduced us to a young woman who sang acapella as the waves lapped the boat. It was absolutely lovely. And then Fungie showed up!" The overall experience was great. Very good group to travel with and almost always left on time to each site. Did a good job of providing a variety of sites and some free time to balance. "The visit to the cemetery in Dublin likely qualifies as my "wow" moment. The tour guide there provided interesting stories along with a great sense of humor. It helped cement the legacy of Daniel O'Connell. Honorable mention to the pub music in Dingle, which was amazing." Our trip was nicely organized and conducted. It exceeded my expectations, thank you. "The Dingle location and tour." "It had to be the Cliffs of Moher. It was spectacular." The Rick Steves tour package is of incredible overall value. When I consider the investment made in the package price and all we got from it: the store credit, excellent pre-tour communication, top-notch lead guide and guest guides, amazing shared meals, convenient and beautiful hotels/B&B, and the choices of sites and experiences (balance of planned and "on your own" time). Overall, a great value and helped create amazing memories for my wife and me for our 20th wedding anniversary trip! "Oh...so hard to choose! I guess my mind keeps going back to Glendalough. I could spend a week there just soaking in the nature, the peace, the history, and the people. Due to the itinerary, we didn't get a chance to see the areas and villages around the main friary ruins and cemetery. (no complaints...we needed to get to Dublin, which was also great). Would go back in a heartbeat." First tour, and I hope it won't be my last! The personal knowledge of the tour guide -- Stephen -- added great depth to the experience. The size of the tour made it possible to get to know each member and spend time with each. And, although no one at Rick Steves had anything to do with the weather, it couldn't have been better! "Dingle and the Dingle Peninsula was my favorite part of the tour. But the wow moments were the Falconery visit and the music event following dinner that same night." We've appreciated RS guidebooks (and suitcases!) for over 10 years, but this was our first tour. Such a treat! Great mix of seeing sights and free time to explore. Got a better grasp of the history of Ireland. Stellar guide, driver, and group to travel with who enriched our experience as we got to know each other and heard each other's perspectives. One member started a Facebook group so we could share pictures & stay in touch during & after the tour - helps me continue to process it all! "The falconry; the O'Se family music & dance presentation at our Dingle B&B; the Duo musical evening at Dingle's Neligans. Such amazing talent, arranged just for us." "The falconry experience. The nicest part about it was it was not on the itinerary, was totally unexpected and the setting was absolutely incredible." My experience was outstanding! Starting with the welcome in Ennis to the parting Dinner celebration in Dublin the experience was first rate. Stephen was warm and welcoming. He shared his great knowledge of Ireland, it's people, culture and history! I loved the experiences of feeding the baby lambs and the Irish music and dancing. We had a great group who quickly bonded and made the experience one we will always remember! Our accommodation were wonderful and the food was always amazing! "I especially loved the history of Ireland and would have to rate Newgrange as outstanding! Indeed to say that I especially appreciated our bus driver Dave and his outstanding driving during our tour! We were safe and comfortable." I liked that all transportation, hotels, site visits, and some of the meals were arranged for us. It made for a stress free traveling vacation. All of the tour guides were knowledgeable and cordial. The entire group was friendly and a joy to be with. All the sites we visited were fascinating; Ireland is an amazing place. Loved the land and the people! "Dingle Town, Dingle Peninsula, Blasket Center and the Cliffs of Moher were my favorite wow moments. I will visit Ireland again." This was my 3rd Rick Steves tour, and it did not disappoint! I traveled with my mother to celebrate her 80th birthday, so it was so wonderful to just be able to know that someone else was driving those narrow roads (Michael was awesome), and listen to Stephen regale us with stories of Ireland, and enjoy the amazing experiences. The destinations, experiences, and extra touches were spectacular as usual! You all [INVALID]d an unforgettable and special time for my mom and I to experience together. "All was great, difficult to pick just one, but our tour of the Dingle Peninsula, including bottle-feeding adorable lambs (the farmer was definitely counting lamb heads as I got back onto the bus! ), beehive huts, crystal cutting, Blasket Centre, oratory, and just the amazing scenery, was wonderful. I do have to give Stephen props for all the special touches, such as the falconry demonstration, whiskey tasting, and amazingly talented family of musicians and RiverDancer!" Exceptional. We learned so much about the history, culture, music and people of Ireland. "Two for me: (1) EVERYTHING Dingle (falconer, whisky tasting, B&B, gourmet dinner at the B&B, Gaelic music and dancing, and Slea Head Drive) (2) the structure and passage tombs at Newgrange and learning that this site is older than Stonehenge!" Our tour was wonderful! We were blessed with beautiful weather,lovely hotels and delicious food and wonderful tour mates and a great tour leader! We very much enjoyed the beautiful Irish wolfhounds, the falconry experience and feeding and holding baby lambs. We were exposed to gorgeous scenery and lovely castles! Loved this tour! "The Cliffs of Moher were amazing as was the falconry experience in Dingle! Also loved the Irish singing and dancing at the bar in Dingle. It was all "Wow"." It was all we had hoped for: great scenery, a chance to learn about Irish culture, very good food, nice hotels and great people. Having a guide and a driver made us able to relax and enjoy the trip. "Hmmm.......It's hard to choose. The Slea Head Drive on Dingle Peninsula was gorgeous but I also found the tombs of Bru na Boinne a fascinating look back at some of Ireland's earliest history." I had a lot of fun on the tour! The tour members were fun and the guides were informative. The bus driver was wonderful. My favorite part of the tour was on the western side of the country (Dingle was wonderful!). The group dinners were spectacular! "My favorite part of the trip was going to the Cliffs of Moher. It was beautiful there! I also really enjoyed the Slea Head drive." The tour exceeded our exceptions.Our tour guide (Lynn) was exceptional as well as the tour guides at each stop. "Dingle - the private concert, the town, the food and definitely the room. I did not expect the food to be so good and was surprised to have a private concert with the caliber and musicianship of Muireann Nic Amhlaiubh and Douogh Hennesy. I'm a fan of Celtic Music and they were fantastic." We had a fantastic time. I can't think of any of the activities/site visits that we did that I would rather have skipped for something else. The trip was very full: scenery, history, music, culture. Everything fit together beautifully. Our guide Lynn was great fun and so was our tour group. I was surprised at how much travelling with others enriched our overall experience; my husband and I really enjoyed our fellow travelers. "The passage tombs - to be able to enter such an ancient structure was quite a "Wow." Also Trinity College, Cliffs of Mohr, and our Dingle music. Also the Hole in the Wall pub performance." Lynn was a very knowledgeable and friendly tour leader. She provided us a vast history of Ireland, through each stop she continued to share the local history of the territory and brought us into the Ireland's history. Also, Lynn's encouragement for us to get to know our other "tourmates" has lead to new friendships throughout the US. "Cliffs of Mohr were spectacular. Dingle stay was impressive, from the rooms, to the private music and Dingle Crystal tour." We had been on another Rick Steves tour and wanted to share the experience with our grown children, so we took them with us on this trip. It was great being able to share the beauty of Ireland and the good-natured joy of the Irish people with them. We loved the small, family-size tour group and the friendships we formed in such a short time. We really enjoyed learning about the country and its culture (especially the music) as we traveled across this beautiful land. We had a blast! "Picking a favorite wow moment is hard, but the Cliffs of Mohr and Newgrange are tied for our faves. The Cliffs of Mohr are an indescribable sample of God's breathtaking creation while Newgrange is an unbelievable testimony to man's brilliant creativity and skill. There were no fancy computers or tools when that burial chamber was constructed thousands of years ago!" Everything was excellent right from the beginning. Expected more rain...was pleasantly surprised that we had good weather, esp. at the Cliffs of Mohrer. Our group was very congenial and I enjoyed meeting everyone. "Believe it or not, I loved the cemetery and the botanical garden. Especially, enjoyed the scenery from the bus." The entire tour was great. This was our first tour experience and we couldn't have been happier. Joe was a wonderful guide. He made sure each of us on the tour were enjoying the trip. He made great choices for dinners together and had good suggestions for meals on our own as well. The hotel choices were great. It was always fun to see what the next hotel would be like. All of them were delightful. We enjoyed our time with others on the trip as well as the time on our own. "I think the Dingle was the most enjoyable. The hotel was great, the activities planned were really fun and the scenery was fantastic." Not our first coach tour, done many, but first with Rick Steves. The tour was good. It was very busy, there was a lot of walking. I enjoyed making a carry-on work for a 10 day tour. I don't think I will ever bring a big suitcase on a tour again! The sites were interesting, the hotels, b&b good, not fabulous. "We really wanted to spend time in Dingle, so that may have been the highlight. The scenery is so beautiful. And we had lots of fun on our cruise in Dingle harbour looking for Fungie. That was probably the wow moment for us." "The tour guide in Dublin who looked like Tim Conway from the old Carol Burnett show. He was funny and wicked." This was my fourth Rick Steves tour. I was surprised and disappointed to see that the number of travelers in these "small" groups continues to get bigger. Our group had 28 members assigned to it. I'm hopeful that this trend will reverse and the numbers get back down to the 24 member group level that made traveling with Rick Steve's tours so attractive in the first place. "Dingle Peninsula; Slea Head Drive"
This is my second Rick Steves tour --and certainly won't be the last. Our tour guide had everything so well organized ---and kept us all in line. I know that much care is taken to make our trip the best. Joe made this trip a huge success for us. He was knowledgeable, organized and fun! The itinerary was a good combination of landscape, towns and history. Ending in Dublin let us see the big city life which included historical sites and plenty of pubs and good food! We really enjoyed the music. The concert at the Dingle Music Shop was great fun as was the entertainment at the Milltown House. It all helped us learn about the people and their culture. "The Dingle coast was amazing and staying at Milltown House was a real joy." We had a great trip. I think we lucked out with the weather, because it only rained one day in the 14 we were on the Emerald Isle. Our tour guide, Joe, was good, always helpful and informing. The days were busy, which I like, and there were always lots of other guides when we were in an area that needed one to explain that part of the country. Our group was good. We were the only Canadians, and the other 26 were from the U.S. Based on my experience, I would take another Rick Steves trip. "I wanted to see the Dingle Peninsula area, and it was a highlight for me. Really, the whole trip was good. The areas and everything we saw was well thought out. I like being busy on these bus trips, and this trip met my expectations. We were always ready for bed at the end of the day. Really like the Rock of Cashel, hadn't been there before in Ireland." This was our first trip to Ireland. We thought we would rent a car and drive around the island for a week or two. After talking with friends it became clear that perhaps we should re-think the driving part. And I'm so glad we did! This is our 4th adventure with Rick Steves' and it was fabulous! We had a large group of well traveled individuals, thoughtful, warm and funny! We covered a lot of ground and saw many remarkable sights. "Our time in Dingle! The drive along the coast, the Blasket Islands and the stories told by our local guide while on the bus. Beautiful!" Our Irish adventure was exciting and educational. We traveled with a wonderful group of people with an excellent, educational and fun loving guide, Joe. We felt safe with our bus driver Michael. The town of Dingle was my favorite destination. Our days were packed full of adventures. None of the walks were too strenuous and the beauty of the countr ywas most enjoyable. I enjoyed the geology of the country and the archaelogical ruins. "Arriving in Ireland and realizing, I was in my grandmother's home country. In some towns it was like stepping back in time and I could picture the people surviving in tough times. Dingle was my most exciting town from the buildings to the music and the people. Ireland is full of people with great senses of humor." The tour made me want to go back ! A great variety of things to do and see. "The concert at the Dingle Music Store. Great music ! And a dancer from Riverdance ! I had a front row seat. The night was magical." I loved my tour of Ireland! It was incredibly well organized and our guide Stephen truly made it special through his extensive knowledge and humor. "There were so MANY! Each location had its own "wow" moment. The evening at Milltown House in Dingle was incredible and so memorable, as was the evening of music at The Music Shop in Dingle. Newgrange was awe-inspiring." The tour gave us a more personal view of what it means to be Irish, to be part of the diaspora and how the history of the island influences the way forward. Ireland's story is far from complete, it is a very dynamic country. We could not have learned so much from a tour geared only to showing us the famous tourist spots. Thanks to Stephen for his in depth knowledge of all things Irish, and for the selfless way he shared personal stories that brought us into the Irish family life. He's superb! "Newgrange. The way the tomb has been renovated and the simulation of the sunrise was amazing." This was a very enjoyable tour. I had been to Ireland once before, with a different tour company, but I felt that this Rick Steves tour gave me a much better feeling for the people and history of Ireland. This tour was not at all "touristy," i.e. just being taken from one major sight to another without connecting to the local people. I especially liked the more unusual stops, like Glasnevin Cemetery, after hearing about the heroes of the Irish revolution. "Traveling on Slea Head Drive, with a steep drop-off and the waves of the Atlantic Ocean crashing on the rocks, hundreds of feet below. The stormy day made it even more dramatic. Sitting on the left side of the bus, directly next to the cliff, I was thankful for our very capable bus driver! That drive made me very aware that we were on the western edge of Europe." I had a very good experience on the tour. Our guide, apprentice guide, and local guides were all very good. Generally, the accommodations were good and the food was excellent. It was neat to hear some local musicians in Dingle but I was hoping for more "traditional" Irish music. The countryside was beautiful and I enjoyed visiting Dublin too. There was a good balance of group and free time. We got some rain (two storms blew through) but that's what makes Ireland the "Emerald Isle"! "My favorite "wow" moment from my tour was visiting the Cliffs of Moher. Even though we were there during the remnants of Tropical Storm Helene (which made for some dramatic, wind-swept pictures) it was still awe inspiring." This was a great experience. Our tour guide, Stephen, was outstanding! Well planned, very historic, thanks to Stephen, great food and all but one hotel were outstanding. Would highly recommend Rick Steves Tours. "The Dingle Coast was spectacular! It was very generous of Stephen to welcome us into his beautiful home." Green Ireland lots of rain, good for Californians. Amazing visits - beautiful tidy towns, rich history everywhere brought to life by guides. Irish stories by guides and musicians in pubs and shops. Spectacular scenes in Moher and Dingle peninsula, windy, too. Great Blasket Museum super; our assistant guide playing Irish pipes. Sheep and cattle in the green fields. Sampling local drinks and foods. Incredible ruins going back thru medieval to the stone age. Wonderful Irish hospitality! "Two events are particularly memorable for this tour; Watching a falconer and handling his four large birds at guide's home in Dingle. Visit to the stone age rock dome tomb, bru na Boinne. Experiencing the effect of the sun lighting the darkened tomb center as on the winter solstice." Great quick overview of Ireland. As usual for Rick Steeve's tours, the tour guide was excellent. "The tomb at Newgrange was the highlight for me." This was our 15th Rick Steves' tour and despite the weather-the U.S.east coast hurricane finished up in Ireland-we had a very good time. The group didn't develop the usual camaraderie but were very nice. As always, the guides were wonderful. Stephen is a great story teller and has a very nice singing voice, too. Kieran was a great musician and I really enjoyed his playing and explaining the pipes.I learned a lot of Irish history and its significance. Ireland is a very beautiful place. "I loved the day we spent at Stephen's guest house where we were treated to lunch, a whisky and gin tasting presented by Stephen, a fantastic experience holding a hawk, falcon, owl and golden eagle-absolutely amazing. This was followed by a delicious 3 course meal with all kinds of food, an Irish bagpipe concert and explanation by Kieran and a reading by a local author suffering from MS from his very interesting book." A wonderful trip through the heart of Ireland. Stephen was a delight with always something interesting to share with the group. "A golden eagle rested on my arm." Loved the tour. Greatly appreciate the way the tour was designed. We covered a lot of territory. Would not mind spending a little more time in Kilkenny and really enjoyed the tour overall. Beautiful country, wonderful guides, good stops, excellent music. "Seeing the vivid green on the hillsides of Ireland." The guides were great at every location and Lisa was wonderful. I enjoyed the balance of time on our own and group time. "The Black Abbey was a "wow" moment. I especially enjoyed all the outdoor experiences. Dingle,Blasket Islands, Glendalough." It was outstanding in every way. The tour guide (Lisa) was amazing. Funny, patient, knowledgeable, and generous. The group of people traveling with me were lovely. The meals and hotels selected were great. Great locations were included on the itinerary. We were given excellent pre-trip instructions about packing, etc. My only complain is that the hotel in Kilkenny was not good. But I understand that this stop has only recently been added to the tour. The food was not good either. "How amazingly green Ireland is"
This was our second Rick Steves' tour and we had a wonderful time. Lisa, our guide, is very knowledgeable and gave us a lot of information as we traveled each day to our destination. We certainly learned a lot about Irish history. The accommodations were exceptional, the local guides were charming, and we experienced a lot in a short time. "We loved the Dingle Peninsula and touring the Blasket Island visitor center. We also enjoyed seeing the Chester Beatty Library (toured on our own) in Dublin which was every bit the rival of the Book of Kells exhibit." From start to finish our tour of the Emerald Isle was first rate. Our tour guide (Lisa), the places visited, the accommodations, meals and overall atmosphere were excellent. "There's an abundance of candidates for "wow" moments with this tour and a challenge to narrow it down to one. Probably the evening of music at the pub in Dingle is that moment. It was everything and more that one would hope for in an Irish pub; captivating music, enchanting pub ambience, people dancing, and engaging conversation. Of course the rest of the Dingle peninsular is amazing, too. Irish is the everyday language. The scenery is breath taking and a great Blasket Island museum." We had a great 8 days. Loved the Irish countryside, the music, the walking tours and our tour guide. We also really liked our fellow travelers, good group of people. "I think there were two different wow moments. One was seeing the Irish seascape. The second was learning more about Irish history." Overall I think the trip was very good. There were a lot of things covered and I like the fact that we stayed in smaller towns and were exposed to the local culture. Our guide, Lisa and Michael the bus driver were great and very attentive. Had never been to Ireland and would gladly return! "Experiencing the Irish culture throughout this tour !!!! Great people, places, and appreciation of their amazing history !" "There was no simple WOW moment. The whole trip was delightful The cliffs of Moher of course are spectacular. So is catching a glimpse of the porpoise in ........ (sorry I'm haveng a brain freeze). Well, as I said.....the whole trip ws great. I wish that I had signed up for the lower one !!!" I was pleasantly surprised. After 20 years of travel through Europe using Rick's guides, I was uncertain if a tour would be right for me. I envisioned the meals to be a step above back-packing faire, only to be delighted by the excellent meals we enjoyed. This tour certainly offered an exhaustive itinerary, and I was uncertain if I could keep up at 68 years of age. No problem. Our group might be classified as a bit older, so we were pretty much all going at the same pace. "Dingle Town: local music Glendalough: serene, contemplative venue Glasnevin Cemetery: Extraordinary final resting place of so many Irish luminaries. Our guide, Seamus was very informed and imparted a certain Irish impishness in his smile that helped lift the mood when hearing the often tragic stories of those interred in the grave yard. And, The Glasnevin is as captivating as the Pere Lachaise in Paris. Only tidier!" Kept us very busy. Little time to recoup at hotel before on the go again. We did see a lot however. "Scenery, i.e. Cliffs of Mohr and drive along coast." This was a dream come true for me. When I was a little girl and discovered that I had some Irish ancestry in my family, I decided that was pretty special and wished I could go see the "Green Isle". Then I met and married a man with the last name of Murphy. That sealed the deal and for our 40th Wedding Anniversary, we joined his sister and husband-who have been on Rick Steves tours in the past and always raved about the quality of them. We were not disappointed. "Seeing all the various green of Ireland from the air as we flew in. Then seeing it again as we rode our bus to the Dingle coast and saw the Cliffs of Moher." The tour of Ireland was a great experience. I saw and did mant things that I would have not done on my own. "The Pub experence with the Irish music." It was perfect from start to finish. Although only 8 days, I feel I really experienced the highlights of Ireland. The people were so warm and friendly, the food was outstanding and their culture is so interesting. Roxanne was great in sharing the history of the Republic of Ireland. Our tour group was liked minded and adventuresome and got along well. "I really enjoyed the time spent in Dingle and the tour we took to the Great Blasket Center. Our local guide was so entertaining and well informed about all the stops on the Slea Head Drive. It was fun to attend the two evenings of music, one at the church and the second in the music store. It was very touching when the music store owner had us share a moment of silence because it was the anniversary of 9/11. Being too jet lagged to go to the pubs at 9:30, these early venues were perfect." My trip was fabulous. Our group was a really terrific group which of course just made the trip even better. I really loved the small towns we visited, and would have liked to have spent more time them. If I had to change one thing I would have preferred to start in Dublin and end in Ennis. I think the time in Dublin could have been a day shorter and an extra day in Ennis would have been amazing. "Oh my... There were so many. I would say the Dingle Peninsula. There was so much to see and our weather could not have been any better. It was a beautiful day and ended with traditional Irish music in a small concert hall. It was just the perfect day. Although the Cliffs of Mohr were also terrific!!!" Rozanne, our guide was excellent. She had a pleasant personality, delivered great commentaries, well-organized and available to help you individually. There was a good balance between tour time and free time. The hotels were excellent. The tour sponsered meals were delicious. The tour bus used out side of Dublin could have provided more leg space. I liked the bus in that it provided enough space for individuals to sit separately if they so desired. "My "wow" moments were the lovely Dingle evening concerts and our 1/2 day in Glendalough walking to the lake and visiting the monestic settlement." This was my first trip to Ireland, a place I have long wanted to visit, but never managed to accomplish. The tour gave me a splendid introduction to this beautiful land and and its lively and exuberant people. "There was not one particular "Wow" moment, but several highlights: 1) the scenery on the Slea Head Drive around the Dingle Peninsula 2) the two successive musical evening in Dingle 3) Dublin! Our walk around the city, Trinity College, and the Book of Kells exhibit 4) the warmth, friendliness and irrepressible humor of the Irish people"
Ireland was wonderful. Our guide Joe was perfect. He kept us very busy and filled our day with wonderful Irish history, and great sights. We really couldn't have asked for anything more from him! I do wish we had a bit more time in Dublin. It seems that with so much to see and do there we should have had a bit more free time or one more day. We missed some of the museums because we were so busy. Though I liked seeing the tombs I felt it was a long day lost. would like to see more of Kilkenny. "Loved the Blasket Islands ! Fascinating and beautiful. The Cliffs were fabulous..we had clouds so sure it would have even been more beautiful on a sunny day. Loved the added music to a couple of our days!" Our tour guide, Joe, and Michael, our bus driver, truly made this a memorable tour! From the very start, this group seemed to enjoy one another's company, which truly made it special, and Joe Darcy was the best when it came to local history, amusing anecdotes, and musical entertainment on the bus rides through the pristine Irish countryside. The lunches and dinners provided through the tour were amazing, and so were the venues. "The Slea Head Drive was spectacular, and the sun came out for us that day and sparkled on the water. Thankfully Joe took our group photo there! The Great Blasket Center remains a favorite of mine with its poignant history." We really enjoyed our 8 day tour of Ireland. We had an excellent, informative guide, Joe with a great sense of humor. The tour group was very compatible. The weather was a little bit of everything. We particularly enjoyed Dingle & the beautiful drive around the Dingle Peninsula. The hotel in Ennis was lovely, the B and B in Dingle was very nice with a delicious breakfast, the hotel in Kilkenny was not up to the usual Rick Steve's standards & Dublin's was well-located & comfortable. "The music and dance presentations in Dingle were charming and the drive around the Dingle Peninsula on a particularly sunny day was outstanding." First, it is important to say I trust this company. Key to enjoyment for me. It was our first RS tour and it met every expectation and exceeded a few particularly our guide for the week. The pace was easy and the stops were quite interesting. Thank you! "Wow was the Dingle peninsula. The whole "package" from the Clonmara Inn to the concert in the Music Store was wow!! Also loved seeing how the crystal was made. I have dreamed about seeing that since I was young. It was always the standard for fine crystal in my family! Now I own two lovely whiskey glasses. The "lowest" time was the concert and entire evening at Milltown. Unforgettable to see the pride on that Mom's face as here son danced his Irish heart out for us. Thank you!" Enjoyed every activity and location. I felt like I was getting a locals point of view about his country, county,and town. "Cliffs of Moher and the countyside were what I most liked about the tour. Also the trip to the cemetery in Dublin was a super surprise." We were a little skeptical about using a big tour company. The prices seemed a little high and we weren't sure we would like having our activities planned by someone else. From the minute we met our tour guide, Joe, we knew we had made the right decision. Joe made Ireland come alive for us. We saw and experienced Ireland in a manner we could not have achieved on our own. It was a perfect experience of Ireland and left us wanting more. "One evening Joe arranged an amateur music concert for us at a local music store in Dingle. The young performers were amazing. The venue was compact and personal. The talented performers entertained us with Irish songs, dance and music. It was marvelous. We are still talking about it. Thank you, Joe!" Smooth and fun; only glitch was heavy rainin Dingle during tour of bay in boat with poor canvass cover to keep out rain. "1. Trinity College Dublin and Book of Kells 2. Beauty of Dingle peninsula"
This was out second outstanding RS tour. The Irish tour was great in spite of some wet and windy weather at the beginning. Joe, our guide revealed all the best of the country [INVALID] great food, music, the big outdoors, historic spots, current events, and he made it easy to connect with the others in our group. A+! "Loved the Dingle bay area -- beautiful scenery, lovely guest house, fantastic local music and a wonderful little town." Outstanding overall. Everything we expected. The Irish countryside, the places we visited,the Irish people, the food, the pubs. Cannot imagine a better tour. "The day we visited the Blaskett islands area was my favorite. Overlooking the islands and the sea and the blue sky was simply amazing. Realizing how tough a life the Irish people had because of both the political situation and the famine and immigration really hit home for me during that day." Our guide, Joe Darcy, was fabulous. Our group was terrific. I felt that we spent a bit too much time on the bus. The chosen hotels were generally fine, except for the one in Kilkenny - Kilford Arms. It was shabby and dirty. Facilities were dingy. No need to spend a night there. Less cemeteries and churches, and more museums would be better. Restaurants chosen were very good. "My birthday dinner on Sept. 11, with singing, a cake, and lovely gift from Joe." Our Tour Guide was a lovely, knowledgeable fellow that was well informed and funny. There was too much driving for our liking, but we were happy to have seen the towns we visited. We did not go on the last day's bus trip to the ancient site and cemetery and felt that we made the right decision staying and extra day in Dublin and visiting the sites we could not fit in the day before. Some of our fellow travelers wished they did the same. We have seen similar sites at Stonehenge & Norway. "The Tour guide in Dublin was amazing. A raconteur who cajoled, informed and had a laughing for 3 hours. He was extraordinary It was also a great treat to see Thomas, the Irish river dancer perform." The hotel in Kilkenny was awful.we sat in the bar and there were holes in the wall, peeling wallpaper and an exposed 220 wire beneath our feet. The public bathroom adjacent to the bar was filthy. Only one faucet worked in my bathroom,and in the alley beneath my window was a bar with outdoor seating and the talking and singing as very loud until 11:30pm. We could have skipped the boat trip in Dingle. I wish we could have taken the boat trip from Doolin beneath the Cliffs. "Enjoyed the Dingle stay and tour and the musical evening in Dingle town." First Rick Steves tour and did not know what to expect. WE had a tremendous tour guide (Stephen) who made the tour exceptional - informational but not boring. Excellent guide. He knew a great deal about the history of Ireland. He sang and entertained us with of Ireland. The bus was very comfortable and our driver Michael was a very safe driver. Very much enjoyed the extras of being able to hold a baby lamb and bottle feed the lambs as well as the falcontry experience. Loved that it was a small group touring. Loved seeing all the abbebies, castles and country side. Highly reccomend the tour. "Touring Newgrange. Seeing a structure that is 5000 years old. Seeing how the stones are layered and still keeps the elments out. Enjoyed the demonstration of light entering the tomb every December 21st." I thought the tour was very good and I enjoyed it very much. "I liked the town of Dingle. Stephen showed us a good time at his property with the falconeer, dinner, whiskey tasting. The town was very charming. Also saw an Irish dancer and a Irish duo, which were very good. Even though they would not sing Danny Boy. Also loved feeding the baby lambs." Our guide Stephen made this tour a great trip. He added a lot of personal experience and knowledge that added to the tour. The two days in Dingle were my favorite part of the trip. The time spent at Shephen's B&B for dinner and falconry was very special. My son and I visited Kilmainham Gaol in Dublin on our own and I think you should consider adding that to the tour. I have been on three other R. Steves tours but this was the first one that was only one week. We saw a lot in a short time. "My favorite "WOW" moment was the time spent in Dingle. Since Stephen, our guide, lives there our visit had an extra dimension. The musical performance, the food, the boat tour, glass factory, falconry and the beautiful scenery combined to make this my favorite time on the tour." It was amazing. Our son suggested Ireland when we had done a DNA test and Irish came up in my background. It wasn't on my top 5 tours, but it became the best tour we have been on. It was a perfect blend of old and new. "When Stephen talked about growing up in Ireland and the news that I had watched about Ireland became real." Ireland is beautiful and we lucked into great weather for most of the tour. I am glad we were able to spend so much time on the west coast as the combination of ocean, sky, and landscape is almost hypnotic. Our tour guide was able to introduce us to the tragic and the triumphal in Irish history. Each town we visited had a special character but for me, Dingle was the most appealing. In addition to the 'Fungie' (the dolphin) cruise we were able to participate in a falconry demo. Great tour. "The Blasket Center was very special, not only for the 'wowness' of the physical environment, but the center itself is so well thought out and presented. It was moving to think of the lives of the very tough and creative people who lived on the island until life on the edge could no longer be sustained." I had a good experience overall. I felt that I got a feel for the history of Ireland and its culture. "The beauty of the countryside of south Ireland." This was a great tour that allowed me to see an abundance of Ireland's highlights. Our guide Rozanne was very knowledgeable and kept everything running smoothly. Our bus driver Pascal was awesome! I don't know how he navigated the narrow and windy roads! Every place that we visited was full of wonderful surprises! "I would like to say everything! Cliffs of Moher, Dingle Peninsula, and Bru na Boinne took my breath away! Also, the entertainment that we experienced in Dingle was exceptional! The trio with Seamus Begley was amazing, and the duo at Nelligan's was also wonderful. But when it comes to my biggest "wow", I would have to say watching Tomas O Se tap dance!" The tour was great! We saw so much and learned so much about Ireland and its people. A wonderful experience! "The music! Our evening of Gaelic music in Dingle was wonderful. And add to that the best Irish coffee ever---a "wow" moment!" What an amazing adventure. Ireland is truely a beautiful country. My experience was especially enhanced by the knowledge and personsal touches our guide provided. We saw and learned alot...but I never felt rushed. The pace of the tour was perfect, our local guides were amazing, and our accomodations and meals enhanced the entire experience. "My favorite WOW monment was the local 'concert' in a small dingle music store. Local talent that tours the world, with the added WOW of a special guest performer, one of the singer's young daughter who was a true talent with a beautiful voice. It was a small intimate venue with relaxed personalized performance that I didn't want to end." This was an amazing experience! Well paced and full of surprises. The group was great and we loved Rozanne, Aine, and Paschal. "There were many! The landscape everywhere was breathtaking - our driver took us through some very picturesque scenery. My favorite was Dingle - the peninsula, the history, the music! We stopped for a photo opp and I just stood there and took in the beauty of the coast, the land, all of it. One unexpected amazing visit was Newgrange! Completely in awe. I learned so much every where we went. I wouldn't have wanted to miss any part of it!" Rozanne did a wonderful job of leading a congenial group of travelers through the sights and experiences of the the Emerald Isle. Logistics went very smoothly. Most hotels met high standards. There were six members of our family on the tour and it was the perfect way to bring us all together without the stress of planning. "An unexpected additional event - Rozanne arranged for an interactive session with a master falconer where a hawk, two owls, and a golden eagle flew in a guided manner from person to person." Our tour guide, Dara McCarthy, was the best guide I have ever had on a trip. Everything went very smoothly. Everything was beautifully arranged. All of the sites of interest, accommodations, meals were ready and waiting for us! Dara gave us lots of information about the area we were in but not too much info. He was very easy to listen to. He played us music from the region. Dara had a good sense of humor, was very knowledgeable about the history of Ireland. He took very good care of us! "Traveling the Irish countryside and seeing the beautiful green fields which seemed to go on forever. It was beautiful and relaxing. I also especially enjoyed the very old friary and the site of the Easter Rebellion in Dublin. I enjoyed being in County Meath because my great grandparents emigrated from there." My wife and I had a delightful tine on our tour. We fell in love with the Ireland presented by our tour guide, Dara. We loved every feature of our tour. "My favorite wow moment was the three days we spent in Dublin. Especially, visiting the site of the Easter rebellion and the national cemetery." I was a little apprehensive about traveling solo on a guided tour. I was especially worried about being rushed from one site to another in a frantic mob! Thankfully, that was not the experience I had in Ireland. I appreciate the way the days were organized with just the right amount of activity and time to really enjoy each experience. Our tour guide, Dara, was relaxed and knowledgeable, and he managed to herd cats without ever losing his cool! "That's a very hard question, there were several! I think the visit to the falconer in Dingle was very special, something I have always wanted to do. I also enjoyed the musicians who came to our inn while we were in Dingle. I loved Newgrange, it was so exciting to go inside the mound." I am from Utah, so seeing a country so green and pristine without a bit of rural junk was very refreshing to me. Our tour guide, Dara, made the trip: always charming, conversational, responsive, respectful, and knowledgeable. Although he denies it, he's also a great dj: he introduced each new county we entered with a discussion of its history, notable natives and musicians, and sampling of the local music with an elegant detailed introduction to the tunes, with a perfect amount of quiet time. "Cliffs of Moher, ruins and wilderness walks at Glendalough, walking the shoreline in Dingle to the lighthouse, local pubs with trad Irish bands, sing-a-longs, and a generalized craigh(sic); local people in bars seem so friendly. The falconry demo in Dingle was a real joy; having a hawk land on your gloved hand for a morsel was new, at least to me." Beautiful country . Had my first half pint of Guinness in Ennis. Enjoyed the walk around town. Old ground Hotel was so nice. Really enjoyed the Dingle peninsula & town of Dingle. Kingdom Falconry was so much fun . I think I could have skipped Kilkenny. Hotel was not very good but enjoyed the Kilkenny castle & the farmers market. Dublin was lots of fun. Had some good whiskey at The Whiskey museum....who knew you should sniff & swirl! Enjoyed the walking tour of Dublin. "The Dingle peninsula was so beautiful. Exactly what I expected Ireland would look like. Also the Cliffs of Moher. Super windy that day but view was breathtaking Murray's pub in Dublin. Not part of the tour but wonderful Irish band & dancing"
i injured my foot the day we left home, so i was uncomfortable and couldn't keep up the pace most of the time. one person had a terrible cough and we were afraid of getting sick. "seeing the bus driver, alan, get around the tight corners." This is our 2nd RS tour and this one was much better. Dara was an excellent guide who used his local connections to schedule some very unique and local experiences - things that I never would have thought to arrange. For example, the music events and falconry experience in Dingle. For the most part the lodging was good to very good except for the Clubhouse in Kilkenny. Surely, another place could be found that was nicer. The Inns in Dingle were wonderful with excellent food. "The unexpected interesting tour of the big graveyard in Dublin. The days in Dingle were also my favorite (I could have stayed another day there)." Hotels were inconsistent - 0 to 4 stars. Old Ground Hotel, Ennis - severely water damaged bathroom and brown, water stained carpets outside bathroom. Room 211. Unacceptable. Castlewood House, Dingle - solid 4 star. Club House, Kilkenny - 0 star youth hostel. Ancient and dirty. 16 of 19 on Tripadvisor. A fire trap. We checked out and stayed at the Hibernian at our own cost. Cassidy's Hotel, Dublin - 3 star at best. Feeling uncomfortable in your accommodations really puts a damper on the tour. "Dingle. Atmosphere and activities were very good. Accomdation and included meals were excellent." The quality was very good. I feel like I experienced a lot everyday but it wasn't overwhelming. The hotels and food were great. The people were all very friendly. I can't wait to go on my next trip! "The music shop night was the highlight of the trip. It felt like an intimate authentic Irish experience." This was our first tour and it was awesome. I loved the variety of the tour experiences. It was well-paced except for Day 4 which was very long as we left Dingle in the morning and did not check into our hotel in Kilkenny until 6:30pm. Each day was a new adventure! "I think my favorite WOW moment was on our bus on Slea Head Drive traveling to the Great Blasket Centre to learn about this incredible group of people." This fast paced tour was a wonderful introduction to Ireland. From the first meeting in Ennis, it was clear that Stephen is an outstanding guide. He did a great job of leading, sharing, educating, and entertaining our group through a wonderful range of sites that ranged from the natural beauty of the Cliffs of Moher and the Dingle Peninsula to the historic Rock of Cashel and then on to the pubs of Dublin. I left wishing for more time in this wonderful place. 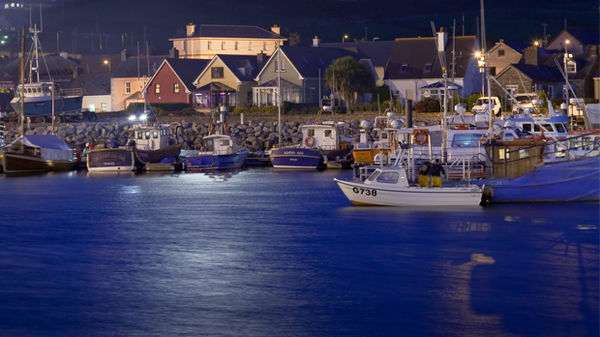 "Dingle was the destination highlight, with the WoW coming from the combination of gorgeous natural beauty, a bustling town with a plethora of options for dining and live music. The concert at the music shop was intimate and special.- it really seemed like an experience that was accessible because of Rick Steves local connections." Having never done one before, I was very skeptical of an extended group tour. But Stephen proved to be the gold standard that all other tour guides should aspire to being. He was informative, insightful and a pleasure to be around. The tour itinerary was entertaining, educational and offered an exceptionally diverse set of experiences. I would not hesitate to take another Rick Steves tour and would not hesitate to recommend "Heart of Ireland" and Stephen to our friends and family. "By far, Newgrange was the most breathtaking event of the tour. ALL the events were enjoyable, but the idea of standing inside a small chamber buried within a giant mound of earth and stone built over 5000 years ago was simply incredible." A week of well-planned, fun-packed activities, history learning and new experiences. It is my second year spending birthday on a RS tour and I cannot think of a better treat than this. Great company of seasoned travelers, delicious foods, excellent accomodations (except in Kilkenney which was so-so), knowledgeable, funny, singing tour guide, skilled bus driver who accompanied us to one of the pubs in Dingle. I managed to checked off my list of musts see/do in Ireland and have experienced moore. "Everyday was a new "wow experience. Slea Head drive, Newgrange, Oratory and Dingle topped my list. I surprisingly enjoyed all the activities in Dingle --interactive concert, river dance performance, cozy B&B with excellent foods and service, pubs, falconry, boat cruise even feeding lambs." Overall, we enjoyed the sites we visited, the tour guide,the bus driver, and the meals we had. With the exception of Kilford Arms Hotel in Kilkenny, we enjoyed the accommodations. The B and B (Heather) was exceptionally clean and the view from our room was beautiful. The meals there were fresh and delicious We could easily have skipped the Kilford Arms Hotel. The hotel was generally run down and our room was dirty. The overall experience could have been outstanding if not for Kilford. "The accommodation at Dingle ("Heahter) was our favorite. The New Grange tour was our WOW site." It was such an amazing trip, ALL of it, sincerely!!! Our guide, Dara, made the trip so excellent with his passion and pride for Ireland, his Irish heritage and family, old Irish music, Hurling, history etc. "Meeting the Irish people in pubs and Dara's family. I took away a real appreciation for them. Their wit, gift of gab, sarcastic humor, and friendliness. Wonderful people!" "Every day - all day"
Great trip! Our tour guide Dara was fantastic. Learned a lot of history, as well as, some of the native language. Experienced the native music first hand through his talented family. Dara made us realize how important family is in Ireland. This was my fifth Rick Steve's trip and definitely my favorite. "Exploring the village of Dingle. The concert in Dara's music shop was a definite wow." Our Ireland tour was a colourful explosion of sights, sounds, song and story, bringing to life the history of the Irish people. We were immersed in tales of tragedy and triumph through walking tours. We were regaled with jokes and stories by our very animated and energetic tour guide, Dara. Several bonus events added to the already excellent tour experience. We stayed in small towns and in the big city, and each place had its unique charm. Meals were outstanding. Tour members were awesome! "Too many to choose from! Falconry: these amazing birds alighting on our arms[INVALID]incredible! Trinity College tour[INVALID]the Book of Kells and the library! The Cliffs of Moher[INVALID]the clouds parting just in time to see the view. The concert at the music store in Dingle[INVALID]so wonderful! Looking for Fungie in Dingle[INVALID]great fun to be out on the water." "Irish countryside and friendly people." This was our first Rick Steves' tour and it exceeded our expectations in every way. All details were taken care of and executed seamlessly. If there were glitches, we were never aware. We were fortunate to have an experienced and engaging tour guide, as well as fellow tour members who were friendly and easy to travel with. We were prepared to enjoy the natural beauty of Ireland, but we came away with so much more, learning about history, music, culture, food, economics and politics. "We didn't have one wow moment. Instead, every day held moments we will never forget: Watching the final 20 minutes of the National Hurling Championship from a pub in Ennis; breathtaking landscapes around every turn; an Indiana Jones trek into a site that predates the pyramids; seeing evidence that man has been in relationship with a higher power for centuries; having to navigate closed-off streets because the Pope was in town!" Overall, we had a very good time. The tour was everything that was promised and at times, a bit more. The group was nice and everyone was friendly and helpful. "Perhaps just seeing the beautiful Irish countryside. The old castles and ruins were interesting as well but it would be hard to isolate just one moment with such wonderful things almost everyday." An excellent tour filled with memories of the beautiful country, its people and its history. Our tour guide, Dara, was exceptional with his historical knowledge and making sure that we had every opportunity to experience the local culture, music, the pubs and the food. This was much more than a tour to just see the sights. We saw and learned a great deal thanks to Dara. "This is a hard one as it seemed like every day was a wow moment. The view from our B&B in Dingle was exceptional, and even included a falcon, eagle and owl exhibition that was great! The bus rides on the narrow roads were amazing and especially the breath taking ride out to the Blasket Islands by the Bee Hives. Great job Caroline! I suppose being in Dublin during the Pope's visit when his "Pope mobile" passed within 2 blocks of our hotel needs to be my list as well." This was an exceptional tour, and primarily because of Dara. His knowledge of the language, his scope of friends and family that we met along the way, made it unique and very special. How many people can sit at a pub Friday night in Dublin with your tour guide's uncle, and the next night, that uncle is singing for the Pope!! the sights were wonderful, but it is the people we will remember most. "Holding a golden eagle, hearing our guide's uncle sing for us, the food. There are too many." Hi, our tour guide was terrific! He created an atmosphere that made us all get to know one another to the extsent that we exchanged email addresses and pictures. For me that greatest thing he did was look after my needs when something the group did I could not manage to do because my bad back prevented me from walking a lot. The tour itself was wonderful. My husband and I would chose Rick Steves' again when we travel to Europe. "The sites chosen were good, and the restaurants gave us excellent meals. Only one hotel, which was for only one night, was not a good one. I understand that it must be difficult sometimes to book a good hotel for travellers (If my memory serves me, that was the one-night stay in Kilkenney." We had a fantastic experience on this tour of Ireland. I've recommended it to everyone I've told about it upon our return. The tour was very well-organized, our tour guide was was great, food was fabulous, and our tour group was very friendly and fun, just the right size. "Eric the Falconer in Dingle was our favorite experience. He and his birds gave us an experience of a lifetime for us animal lovers and bird enthusiasts. But many of the other activities were also "wow" moments!" I can't think of one thing that would have made this tour better! Stephen's stories, commentary, history lessons, and connections to local people were the icing on the cake. I thought being with a larger tour group would be cheesy and wasn't sure how our group would do. We LOVED every minute and can't wait for another one. "I have tried to come up with what I think was my favorite part of the tour. I honestly think our entire Dingle visit was my "wow" moment. The added bonus opportunities there with falconry, dancing, bread making, and sheep holding really made us feel like we experienced "real" Ireland." We enjoyed seeing the beauty of the forty shades of green of Irelands countryside. Our tour guide was the best one we had of our three Rick Steve's tours and the nicest group of people of our three tours! We would have preferred spending a little more time in Dingle and less time in Dublin. "Seeing the cliffs at Moher!" "I can't pick just one. It would probably be the little extras our tour guide set us up with....the falconry experience, feeding lambs, the best irish dancer in the world stopping by during dinner"
I don't think I have smiled this much in a long time. We covered a ton of Ireland that left me both satisfied and wanting to return. On a normal trip we would self guide and arrange day guides and trips. It was so nice to have someone handle it for us while building in chunks of time where we were on our own to explore or pursue an activity we chose. "The time at Milltown House in Dingle. We were greeted by the house dogs (two Irish Wolfhounds). Note: If you scratch Shamus on his cheek just below his ears he tends to lean into you. We then got to experience falconry (bucket list check off), Irish Dancing, Irish singing and a talk with a local chef. Can I add that the food was terrific. Especially the scones. I would be remiss if I didn't mention the small pubs in town where a pint can lead to a real conversation." Great historical info conveyed, great sites, great food... all around a good tour. "Not sure I could limit the moments to a single wow... very much enjoyed the scenery while traversing between towns, very much like the small town/ village feel of many of the places. Stopped at an awesome castle, just to use the bathroom, but Stephen organized an awesome hour tour of the place, which was a serious bonus (versus just driving past the place). Newgrange was pretty awesome... unfortunately just saw fog at the Cliffs of Moher. Dublin was cool (Guinness and Jamison tours, and more)." This was our first Rick Steves tour, and it lived up to everything our friends had told us about it. I'm used to travel on our own, doing lots of research so that I know where I want to go and what I'm looking at. Having a guide like Stephen made that simply go away, and the result was delightful (more below). I've never been to Ireland before, but we knew it would be beautiful (and it was) and that the people would be more than friendly (and they were). "The competition for this award is too broad and too close. We loved Dingle (everyone loves Dingle), though I was blown away by how hard the living would have been with the rocks and the steepness of the slopes. Seeing the houses simply abandoned because of the famine, whether through death or emigration, really brought home the desperateness and the tragedy of those times. The Book of Kells must be a perennial contender for "wow" moment, and it certainly was for us." I thought our tour was well conducted and filled with many interesting activities. Our leader, Stephen, was patient and informative. My teenagers were a bit restless at times, but when are they not! My 90-year-old mother had a good trip and I am thankful for that! "I think my favorite spots on the tour were the Castle Rock and Glendalaugh." The tour guide and bus driver (Caroline) were fabulous. Can't say enough positive. I was extremily disappointed in the accomodations. I don't expect much, but when R Steves rate a hotel as 2 out of 5 in his guidebook and then books us into it, it's pretty sad. Concerns included: 1 hotel had 3 flights of stairs without elevator access. This was difficult for the young yet alone the elderly (85yo and 91yo). In another hotel booked on the 3rd floor. No air, 85 degrees without relief. "Dingle - Need more time there." The tour was wonderful. Our guide,Stephen ,was the best . The bed-and-breakfast in Dingle was exceptionally beautiful and well run.The Cassidy hotel in Dublin was not up to par -especially the plumbing. "Getting to know our driver Carolyn was the highlight of this trip for me. She is a delightful person!" Seeing Ireland has been something my husband and I have wanted to do for some time. I'm glad we went, and it was too short. I wanted to do more but the days went by way too quickly. I will have to return to see more of the country. Ahh, time to see it all is elusive. "The fog at the cliffs of Morhe, very very foggy, could not see a thing. That was wow how can fog be this bad!" The tour was great. The Ireland tour was our third Rick Steves tour. The tour guide was great. We heard about a lot of Irish history and music. We saw a good number of places we would not have visited on our own. "Drive around the Dingle peninsula and the Wrapter event at the B&B on Dingle." We traveled with two of our adult kids, we all thoroughly enjoyed the whole trip. Our guide Dara was outstanding, loved hearing him talk about the history of each place we visited and was especially great to hear the music from each area. We love the size of Rick Steve's tours and the fact that they are guided. We always learn so much. They also attract easy going nice people. "I would have to say the Dingle experience. It encompasses two of my favorite things about Ireland, the indescribably beautiful views of the sheep and countryside, and the views of the shoreline . We saw lots of both on the dingle loop drive. Also the authentic music night we had at the Dingle music shop. And we loved the incredible surprise from Dara of our falconry experience. It was also my favorite accommodation at the Milltown House." The tour was well organized and Dara was an exceptional guide. We lucked out on the weather, so we were able to enjoy visiting most sites in dry, if not sunny, conditions. I particularly enjoyed sites in the western part of the country: the Dingle Penninsula, Dingle Town, the Cliffs of Moher. Group activities there were the most unique, including a falconry demonstration, intimate music experiences and a visit to Dingle Crystal for a glass cutting demonstration. "My favorite wow moment was probably participating in the falconry demonstration, although the scenery on the Slea Head Drive and visit to the Blasket Center came in a close second." I enjoyed the tour very much. I learned a lot about Ireland's history and culture. The selection of cities and sites was well-planned, and none of the coach rides was overly long. We lucked out on the weather, which was a big plus. "The varied experiences in Dingle combined to make our time there a highlight of the tour. In addition to staying in a very nice inn, we enjoyed all of the activities in Dingle: two performances of traditional Irish music by several talented musicians, up close and personal; an exquisite farm-to-table dinner at the inn; a participatory falconry demonstration at the inn; a crystal-cutting demonstration; and a boat ride in beautiful weather in Dingle Bay to see Fungie the dolphin." Ireland was our third Rick Steve's tour and it was every bit as great as the past ones. Our exceptional host Dara, made our visit quite entertaining. Next stop ...... Greece!!! "The live Falconry exhibit was fantastic as well as the continuous Irish music throughout our trip." "The falcon exhibit! The sights/music and the whole experience." Warm, welcoming, energetic, well-paced, full of history and learning, this was a great trip. All aspects were great. Accommodations, the guides, the others on the tour, all fantastic. "Finding Irish musicians playing in a pub on the first night, having "happy birthday" sung for my wife; after that, all the rich history and scenery, all across ireland." Enjoyed the tour. Our guide Dara was excellent. "The drive around the Dingle Peninsula was pretty spectacular. Bus driver Caroline was great." We learned so much about Ireland in such a short period of time. Coming into the tour, I was apprehensive about spending 8 days with 26 other people I had never met, especially with such a jam-packed itinerary. But the schedule, Dara's personality and knowledge about Ireland and his experience as a tour guide quickly helped put all of those concerns to rest. I also think the no-whining policy was very effective - IT WORKED ON ME! HA! "I think the drive around the Dingle Peninsula and the evenings activities in Dingle were my favorites. Hard to top meeting Dara's family and visiting his bar in Dingle." This tour exceeded my expectations. I learned so much about the history and culture of Ireland. I enjoyed visiting the different towns and cities, and all of the historic sites. The other members of our tour group were really great, easy-going, friendly, and easy to talk to. I feel a real connection to the country. I think I left my heart in Ireland. "The whole two days in Dingle were "WOW"!! The Peninsula is just beautiful, and the town is a perfect European, seaside town. The Slea Head Drive was amazing. I particularly loved the personalization that Dara and his family infused into these two days: visiting his bar, meeting members of his family, the concert at the music shop with his uncle. These were unequivocally the highlights of the whole tour. The falconry at Milltown House was also an awesome surprise!" We were hesitant before our trip as we usually travel on our own. However, we had the best time ever. It was nice because the group seemed to be very like minded travelers. We really bonded with the small group. "Dingle with Dara (sp?). He set up so many activities, best was Irish Dancers. He was so personable, we felt like family." I mostly enjoyed the exposure to Irish people and culture. The Pub music scene was unique and Irishmen from all walks of life were kind, funny and very kind to us. What enhanced the tour experience was the other group members who were very nice and friendly. The tour guide was on top of things ensuring our experience will be great. "Laura singing in A Hole in the Wall." "The Dingle Peninsula. Absolutely stunning views." The tour was an overall enjoyable vacation. This is my third Rick Steve's tour (best of Europe my way, and Scandinavia) and this was by far my least favorite. Ireland was amazing. It is an amazing country which far exceeded my expectations. The trip was well designed, with great hotels (esp dingle and ennis) and great sites. This trip however was held back by several stops and by the tour guide. See below for further details. "The bus trip and stops along the Dingle peninsula." Covered a lot of ground in a very comfortable bus. Enjoyed the rapport between tour guide Dara and outstanding bus driver. Other tour members were very pleasant and helpful. Very well organized arrival and departure arrangements. Itinerary was what I expected. Dingle is beautiful. Hotel location great. Consider skipping Kilkenny and wandering more south, perhaps Cork or Waterford. Although I use a walking stick for steps, I wouldn't classify any of the walks as strenuous. "Seeing the beautiful green countryside and seeing the dolphin in Dingle." "We especially enjoyed Ennis and our stay at the Old Ground Hotel-- the dinner that evening was superb.It was a great start!" The trip was a delightful blend of getting to know Ireland - learning its history, experiencing its culture, receiving the hospitality of its people - and becoming friends with people who were strangers at the beginning of the week, all led by personable, capable, kind and caring guides. "My "wow" moments of the trip were the evenings our tour guide Dara arranged for us to be with his family in Dingle. We met Dara's mom and enjoyed a delicious meal prepared by his friend Diedre. We spent an evening in Dara's bar, Nelligan's, complete with music and Irish dancing performed by a local family, and were treated to a concert by Dara's Uncle Seamus in his dad's music shop. It's one thing to see the sights of a country, but to be invited into the lives of its people is a rare privilege." "Riverdancer Tomas Se dancing 3 feet from us in Dingle! We did an impromptu performance of Scottish Dancing and it was an honour to share the stage with Tomas and Seamus Begley in concert at Michael's music shop." I really enjoyed my first organized tour on my third fourth trip across the pond and second in Ireland. I really felt like I got to experience what it means to be Irish and who the irish people are by going to Dingle and Ennis. Our tour guide was fantastic, full of the craic, but also professional and took great care of the tour members. We had great meals, most memorable was in Ennis at Ye Olde Ground, and we ate very very well. Accommodations in Kilkenny would be only negative. "Dingle bus tour. What a beautiful place to explore. I live in scenic Portland, Oregon but this was a breathtaking experience. Seeing the old famine huts and empty potato fields juxtaposed with ocean views and green pastures was really rewarding." A very well planned and executed tour. "The day we spent on the Dingle Peninsular"
Another great RS tour. This is my 4th. I found this tour to be less physically demanding than the others (Rome, Sicily and Greece). The itinerary was perfect[INVALID]just enough time to see the highlights in the cities where we stayed. Dara, our guide, was more than accommodating and has the wealth of knowledge known for the RS tour guides. "Newgrange and the Dingle Peninsula. Sorry...I can't name just one!" The tour was wonderful. I loved the people in our group. Our guide, Dara, was amazing! This trip was a great way to see so much of Ireland. "The whole trip was a "wow" moment for me. Ireland is beautiful...something different in every little village. I loved the historical sights and the ever changing landscape." "the concert in the music shop in Dingle"
Great trip. Well planned and executed. "Having an afternoon working with Falcons, owls, and an eagle." Good group camaraderie, knowledgeable tour guide who was able to use his connections for us to see unusual things such as the birds of prey demonstration and the dancers and musicians in the pubs. "Cliffs of Moher were beautiful. Loved the Irish dancers in the pubs. Really enjoyed the whiskey museum experience which was opened just for our tour group." Very Good tour. I would recommend it to anyone. Dara was very knowldegeable and did not leave us much time to become bored at any stop. Hotels and meals provided were above average. A good bus driver who was also familiar with sites, and friendly, was a plus. A nice variety of sites demonstrating history and culture over a wide time period. There was maybe one too many castles/churches. I would trade one castle or church to make a stop at a national park or nature preserve. "The National Museum of Archeology was most amazing. The "bog" people and Celtic artifacts wqas impressive." excellent in all respects. except maybe the rooms in Kilkenny. Kelford Inn was not great. "the Cliffs of MOher, the falconry demonstration the Bru na Boinne"
Being our first tour we had no idea what to expect. Dara changed all that within the first 24 hrs. His knowledge, pride in his country, and amazing dispostion was so tremendous it's difficult to put my thoughts into words. He made every one of us feel as if we were part of his family.The tour was beautifully planned and [INVALID]d.Our bus driver, Michael, embodied hospitality. The group meals were outstanding and Dara's ability to "mix" us all in was skillful. "The Dingle Peninsula driving tour was spectacular. Our guide, Tim, was truly a great source as he pointed out so many aspects of the landscape. I loved the stops we made and the knowledge he imparted.The personal touches along the way, a homemade raspberry square snackat one location, made us wonder how could this possibly be planned with any more detail. The landscape in and of itself is beautiful but the way it was shown made the experience all that much more amazing." Overall the tour far exceeded my expectations. This was our first tour and we thoroughly enjoyed it. The sights, food, drink, and activities were all far better than I imagined. "I would say the falconry demonstration in Dingle. This was a great and unexpected bonus. I'll never forget holding a golden eagle on my arm." Dara made the tour experience Outstanding. We went with another couple who have been on several other Rick Steves tours, and they also said without exception, Dara has been the best tour guide. "The visit to Dingle Town and the Dingle Peninsula. That was the very best of the whole tour." The Ireland tour was a great experience and our guide was the best. He kept things moving while making it lively and entertaining. "The view from the Cliffs of Moehr"
Even though I had previously traveled to several of the locations on this tour, having a tour guide and someone else driving made the experience much better. I no longer had to worry about driving on the opposite side of the road and think about going in the opposite direction in traffic circles. Instead, I could sit back, relax, and enjoy the scenery and listen to Dara explain what we were seeing. Dara also provided an excellent perspective of Ireland and the Irish people as we rode along. "The two nights of Irish music and dancing on the Dingle Peninsula. For me, these were the two most memorable nights of the tour. :-)"
This was our first tour and it exceeded my expectations. Our guide Dara, driver Michael, and the tour group made it a fun, interesting week. I would not have seen as many sights nor learned as much about Ireland on my own. There was a balance of planned activities and free time and it was a pleasure not to have to figure out the details and transportation. "It would be when I realized what a great week it was going to be with all we were going to see and not even realizing all the unplanned sights; the scenery, countryside, Kingdom Falconry, Irish people and pubs, and experiencing the culture of the small towns. I loved the Dingle peninsula, Glendalough, Newgrange and everything we saw." This is my first experience of a tour. It was above and beyond my expectations. Our tour guide made this trip educational, fun and challenging. We had a fun group that made this trip even more enjoyable. The heart of Ireland, to me, was the small town experience. "I was in awe of the Cliffs of Mohr. The beautiful countryside and the people and music of Ireland enhanced my tour experience." Never having taken a tour before, we truly did not know what to expect, however each day was even better than the day before. Rick Steves' Tour truly delivered as we can't wait to take our next adventure. Our tour guide, Dara Herlihy, was remarkable. Not only did we come away learning about the Ireland culture and her people, but he made us feel one with the country. We yearned to learn more, to experience more, curious on what the next small village had to offer. "There are so many "wow" moments, it is truly hard to pick one. The town of Dingle and its people truly stole my heart. From the Musical Evening at Neligan's listening to Padraig & Michelle and watching Tomas perform Riverdance steps, to the Dingle Crystal showroom, experiencing Falconry first hand which was such a surprise and delight, to the musical night at the Dingle Music Store. We definitely had the luck of the Irish with Dara as our tour guide. Two nights were not enough!!" My second Rick Steves tour lived up to my first experience. I received an excellent value for my Ireland trip with a great group of congenial fellow travelers, good meals, freedom to explore on my own, and increased understanding of the history and culture of the Irish people. I learned so much of Ireland which I never expected such as the mound passage tombs and the Blasket Center. I comprehend the merging of Christianity with the earlier pagan society in the Celtic cross. And I saw Fungie! "The falconry was an unexpected and absolutely awesome surprise. The opportunity to have an eagle, hawks and large owl fly to my arm was phenomenal. I had recently watched a PBS documentary on a British woman resume her dormant falconry skills with a new falcon. To have a small inkling of her experience was simply the cherry on top of an ice cream parfait for me." We loved the tour and meeting people from all over. It was our first tour experience and we were not disappointed. It was a fast paced tour...maybe a little too much. I think we could have used a little bit more downtime. We did love it and would consider doing another tour at some point. "Dingle was my favorite part. From the Slea Head drive to Dara's family bar and his Father's music shop in town and all the performers he arranged for us. He made us all feel like we were good friends visiting him and his family." I thought the tour was very we'll designed and we saw a lot of Ireland in the limited amount of time. This was my fourth Rick Steves tour and Dara, our guide, was the best guide I've had on any of the tours. I didn't care for Dublin very much but I understand the tour has to go there. "The dingle peninsula< beautiful scenery and great people." What tour? It was so amazing Dara made us feel like we were there visiting our extended Irish Family, guiding us in on the best of the Irish culture from food, to music, to pubs, to old history, storytelling to current new politics!! Dara made this trip unforgettable, let me say he was exceptionally giving of himself by sharing his family and experience as an Irishman. He was not just a guide, he was a provider of all the best of an Ireland experience. "Our trip had numerous WOW moments, but our 3 days in Dingle with the local people, the Falconry experience, the fabulous dinner at the Milltown House, the narrated drive of Slea Head and the Pub musical experience with Seamus were unforgettable WOW moments. Dara immersed us in the best of an Irish/Dingle time. It was difficult to leave Dingle, we all would have given up a day of Dublin for more Dingle." It was surprisingly enjoyable. I got to see the places I wanted to see, and many more. I learned more than I could have expected about Ireland, its history, its politics, its culture, and its people. Dara provided so many opportunities to experience all of this. It was especially valuable that he was from Dingle, and allowed us to meet his family members. He also provided a huge amount of great surprises. I can't say enough about how well he made it go. "There were many "wow" moments. But as a student of nonviolence, I was particularly wowed during our walking tour of Ennis. We learned of the Catholic emancipation, accomplished without violence. We learned that Parnell introduced what we now call a boycott, one of the key nonviolent actions. And all of this was centered in Ennis. There was so much history that I can only imagine every tourist is going to have a moment where they just say "wow", as I did many times." "I think her favorite part with seeing the Irish dancing"
It was wonderful for the kids. Dara was wonderful and including my children. The tumor was very engaging for them. "His favorite moment included watching the dancing at the pub, seeing the glass factory, and the bird watching"
The tour exceeded our expectations partly due to the unusually warm and sunny weather which showed us the rugged beauty of the country at its best. Our days were filled with the itinerary items as well as extra surprises such as a birds of prey demonstration with an opportunity to participate and a couple of memorable musical evenings. "The musical evening at Dara's father's music shop. Irish tunes and songs were played on various instruments by Dara's Uncle Seamus and his fellow musician as well as Dara's aunt, cousin and her three talented children. We will always remember Dara's father playing a beautiful tune on his accordian as we waltzed." Gorgeous weather, exceptional guide, friendly tour partners (two from a previous R.S. tour) and a great bus driver. The Ireland of today is as beautiful as my memory. Dingle peninsula is breathtaking: stone-walled fields, rugged coastline, sheep, cows donkeys, all part of the real-life scene. Blasket Center so informative. Dublin busy, noisy, youthful, vibrant. Places between are historic beyond realization and filled with stories they are unable to tell. The guides interpreted so well. "The traditional music provided by Dara's talented family at his father, Michael's, music shop and at Nelligans. These members included his Uncle Seamus and a special performance by his visiting cousin and her three children. What musical genes! At Nelligans, Padraig and Michelle played fiddle, accordion and others while one son played the bodhran drum. Highlight was their Riverdance son, Tomas. He swept us away both nights. Truly wow!" Tour was very good overall. Our tour guide was awesome and bus driver was outstanding. People on the tour were very friendly and everyone got along so well. Very enjoyable. "It was awesome to see Cliffs of Moher finally. The weather was very clear which added to the dramatic moment. That one hour at the Cliffs went by so quick. I wish I had a little more time in Cliffs of Moher. So, I could just seat there and stair at the water and cliffs. Dingle Pennusula was beautiful as well. My only complaint is that we only stopped at couple of spots. If we stopped a few more times at a different view points, it would been better." This was my husband's and my first tour after traveling out of the country several times on our own. I enjoyed it more than I thought I would. The pacing (how much and what we did daily/when we had breaks, etc.) was excellent. Our traveling companions were cordial and timely. The coach bus was comfortable and our driver, Pam, is a kind and talented driver. It was nice to not have to hassle with tickets and reservations. The choice of areas/placed visited was well thought-out. ! "Dara made all the difference with the best part of the trip being part of his community (family, friends, bar, music store concert) in Dingle. Dara is upbeat, kind, caring for each member of the group, knowledgable about Ireland and right-on in terms of organization. We arrived in country 2 days early (Galway/Aran Islands) and stayed 4 more days in Dublin. Our day-trip to NI (WIldRover) showed us that all guides are not as good as Dara. :-)"
"The best experiences were in Dingle, seeing Dara's pub, watching the dancing, music concert. The bus was excellent The meals were also great The best feature though was our guide Dara"
"Seeing the music in the Pub at Dingle and the music concert"
This was our first Rick Steve's tour, but it will not be our last. The weather in Ireland was not what we expected or hoped for. Since we live in the desert, we were looking forward to a bit of rain and cool. However, once we met our guide, Dara, the fun began and little things like weather became secondary. Dara took good care of us, and treated us to so many extras--great restaurant choices, access to the most lively entertainment and music, and lots of patience and good humor. "There were many, but we especially enjoyed visiting Dara's pub in Dingle and having "front row" seats near the musicians and dancer. We also got a bonus visit to a falconry exhibition in Dingle. Being a bird handler myself, it was great to interact with the hawks and other birds." Tour guide Dara was outstanding!!!! I cannot compliment Dara enough on his knowledge of Irish history, his upbeat & positive personality and people skills. All the hotels, restaurants & [INVALID]ions of sites were wonderful. This was my first Rick Steves' tour & I am definitely hooked. The combination of group activities & free time were well balanced. "One of the special moments on the tour was our visit to the Dingle Music Shop owned by Dara & his father Michael. A concert was arranged & our tour group was invited. We had the special treat of Dara's sister & her children performing for us & local residents. It was special because it was a true "local" event & not a staged venue for tourists. We also had the treat of visiting Dara's pub in Dingle (Neligan's) & again we mingled with the local's for more of the genuine Irish life." It Was Amazing! This was our 4th Rick Steve's Tour, and we scheduled Best Of Scotland in 10 days which starts the day after this one ends! That's how much we love Rick Steve's Tours! Dara, our guide was SO MUCH FUN! He brought our group together, he took care of everything any of us needed, we had beautiful weather to see the Cliffs Of Moher! We fell in Love with Dingle! Dara owns a Pub there & we were entertained with music & a gentleman from Riverdance! Amazing! "We Loved Dingle! It was beautiful there and we so enjoyed the Pubs! Our guide set up a Falcon demonstration along with other birds which was awesome! The cruise around Dingle was beautiful. We had a great time visiting the Pubs and looking around Dublin too!" Steven was a delight. Knowledgeable and helpful, he always has a future as a storyteller. They were great! The area of Ireland we traveled was charming and replete with interesting history, sites and personalities. Now if only Rick could exercise some influence on the weather. It was much warmer than we hoped. Thank the travel gods for Dingle with cooler breezes and a delightfully restful atmosphere. "Although difficult to pick just one because I liked the area of the Blasket Islands but loved the falconry exhibition when we were in Dingle." Our guide Stephen was fantastic and really made the tour! The motor coach, driven by Michael were equally impressive. "The town of Dingle was exactly what I would expect a friendly Irish town to be. I enjoyed staying at the B&B and I was impressed that Stephen was part owner... it was like he had invited us into his home. I especially loved the extra activities like the "birds of prey"show." Our trip was a once in a lifetime opportunity. "My first day in Dingle I: 1) Caught a falcon 2) Tasted Irish whiskey 3) Ate a locally sourced meal 4) Performed a Celtic ritual 5) Listened to Traditional Irish Music 6) Watched a famous Irish dancer 7) Saw an Irish rock band 8) Went on a pub crawl So I'll go with that one"
Stephen took great care of everyone. He is a very knowledgeable guide. I came down with a severe cold at the beginning of the trip and also couldn't walk very well because of a foot injury prior to booking the trip. Stephen made sure to inform me of how much walking was required at each stop and where I could take a break when needed. Stephen also had a great sense of humor and had fun sharing his childhood experiences with the group when we traveled through different parts of Ireland. "The B & B at Dingle was a definite WOW moment! My husband and I have an Irish Wolfhound that we were missing very much as we traveled. When we walked up the driveway to the B & B and two Irish Wolfhounds came out to greet us, I lost it! I wanted to stay in Dingle at the B & B for the rest of the tour. Diedre's cooking was top notch; the accommodations were incredible and the 2 wolfhounds made us feel right at home!" "I loved the Gallarus Oratory and the passage tomb at Newgrange. Both were so other worldly and fascinating. I would have skipped the cemetery and toured all the pasasage tombs with that outing. Stephen guided us to see the bog bodies in the Natural History museum- again a "wow" moment- so well displayed." Wonderful visit of Ireland. I wish I could have taken the longer trip. Maybe it will happen in future. "Visiting the Gallarus Oratory and staying at Dingle were my favorites." "Probably Newgrange; I love learning new things and I had never, ever heard of the place before. Just amazing." We had a great experience and were able to see and learn more about Ireland than we would have if we had gone on our own. Stephen is a great guide that went above and beyond to make sure everyone had a good time. "It's hard to limit it to just one "wow" moment as each stop along the way had a "wow" moment." Our guide was excellent - very knowledgable and fun. We had just the right amount of touring together & exploring on our own time. I enjoyed the quaint hotels and being immersed in the Irish culture & the food everywhere was excellent. "Two come to mind. Our two day stay in Dingle was memorable with falconry, whiskey tasting, Irish dancing & music & scone making. Also our last day at the Glasnevin Cemetery & Bru na Boinne - New Grange." Ireland was unseasonably hot, which made standing around in the sun listening to the guides unpleasant. Also, there were issues with non air-conditioned hotels. The sites chosen were very interesting and varied. The activity levels were balanced and flexible. "I loved the Dingle peninsula, especially the wonderful accommodations and varied activities there." As usual,everything was well planned and went off without a hitch. We had a great experience....meet wonderful fellow travelers and had a terrific tour guide. "You know, I'm not sure there was a Wow moment.....Slea Head drive was spectacular. The ancient tombs of Bru na Boinne were interesting plus the Newgrange Nd Knowth...enjoyed Dingle." First time on tour. Good for me since I would not have elected to see of the sights or dive into the details of others. Daily timeline was tight at times. Maybe not pushing to get into hotel before 5 would have felt better. A little too much bus time for me plus the 'fear of using the toilet' left folks a little put off. Bus driver was great and people felt confident in his skills. "Dingle - could have stayed longer there." It was a great first experience! We saw so much of Ireland, met great people and the weather was wonderful. Lisa was very knowledgeable. So were most of our individual guides. The hot weather presented a problem with some of the hotels, as it was hot!! Who would have expected 90 degree days in Ireland?? The hotel in Kilkenny was a pit. Pretty awful. If we had not been with a tour, we would have walked out of that hotel!! Would have liked a little less moving around and more down time. "We loved Dingle, the Slea Head drive, Cliffs of Moher.....but my biggest wow moment was Newgrange. It's just fascinating." Ove the yeas I have traveled the globe, but this was clearly among the finest tours I have ever taken. Lisa did an excellent job leading the tour and the local guides were excellent (the Dublin guide was a standout). My wife and I are already discussing taking all of the family on another trip next year. "It would be hard to top the first day in Dingle with the wonderful people fine lodging, great dinner, Irish whiskey tasting, and good Irish music. One example of how nice people were is that at the whiskey tasting when the bartender and I talked a bit about the differences between the Jameson and the 10 year Jameson, he refilled my glass with the good stuff. The only marginal aspect of the two days would be the necessary boat trip to see Fungie the dolphin... but the scenery was good." Ireland was magical,and Lisa was instrumental in making it that way. "The Dingle music scene--Niamh and Peter, being pulled up by Tomas for a Riverdance lesson at the Scopa Ceol Music Store, Bru na Boinne, Book of Kells... The list goes on...the craic..."
first-timers with Rick Steves' Tours had an excellent overall experience, in every way! The week was exhilarating: an immersive dive into Ireland's diverse places and peoples, with richly descriptive and evocative guidance from Lisa and a half dozen superb local experts. We are deeply grateful for the skillful and knowledgeable, personable and playful leadership of Lisa, and also grateful for our really fine group and our camaraderie across the week. "You will not be surprised to hear that "wow" moments were frequent, and frequently surpassing...the previous one! Sandy[INVALID]"When we visited the Gallarus Oratory, it brought together the whole Dingle landscape/seascape with such a unique emblem of the ingenuity, determination and rugged faith of Ireland's people over centuries." Bill[INVALID]"For breathtaking panoramas, the views on a stunningly beautiful day in Dingle, but a different kind of 'wow' was our spirited music night at Siopa Ceoil."" Good overall experience to 'see Ireland' it's people, culture and country. I went with my mom who is 89 and my sister and the tour was so smooth... There was not any contention between the 3 of us and when you get 3 women who are strong willed from the same family.....well enough said. The trip was well organized and gave us enough down time. I liked everything about this tour. I had a great time. It was interesting and the tour guides were knowledgeable. My overall experience, from start to finish, was 10/10. This was my first bus tour and I was apprehensive not knowing what to expect. The tour guide, Lisa, as well as the drivers we had (Tim in particular) were all positive, professional and courteous. Eight days was a great exposure to the Republic of Ireland and the history, knowledge and information we gained along the way, packed a lot into the eight days. I am so glad I took this tour and I enjoyed Ireland so much. "My "wow" moment had to be the scenery along the Wild Atlantic Way and the Cliffs of Moher. What I especially liked about this eight day tour was we travelled to the coast, the city centres, the farm areas, and a national forest. A perfect blend in my view." The tour was very well planned and Lisa was very good. The information and stories she shared made the trip. I was also taken by how the group bonded during the course of the week. "Stone Age Passage Tomb at Newgrange was an exceptional treat. Even though I was familiar with it, seeing it in person and actually entering the tomb was overwhelming." Unfortunately - it was disappointing. This was our 2nd Rick Steves tour - and we were so happy with our first - we talked 6 of our friends to join us - and I was embarrassed. The driving factor were the last two hotels in Kilkenney and Dublin. "The town of Dingle and the Dingle Peninsula." "I loved the falconry demonstration. I am an animal lover, and I know that I will not have the opportunity to get so close to those beautiful birds again. I also enjoyed feeding the baby lambs, our guide's Irish Wolfhounds, and the boat trip in Dingle Bay. Naturally, all were animal oriented!" This tour went beyond my expectations. Our guide was very knowledgeable, whitty, and always helpful. He enhanced the tour with his personal stories about the places we visited. He also included many extra activities that were not part of the tour. We learned a ton, laughed a lot, and will never forget it. The trip was phenomenal. I am a traveler who loves to do and see "all the things", and this trip was just that. From beautiful scenery, to traditional music, to historical settings, museums, small towns, big cities, delicious food, it was all magical. Our tour guide Stephen planned many extras and surprises for the group. Stephens storytelling and knowledge-sharing on the bus was so entertaining and interesting and made the bus rides fly; we did not want him to stop! "Just being in Ireland was my life dream come true. But my personal highlights where in Dingle, it was just so beautiful and peaceful and charming. I took a few mornings to wake up early and explore more sites on my runs and I have no regrets (connor pass and the trail to the lighthouse for others interested) Glandalough and the cliffs of Moher were magical and would loved to spend more time exploring and hiking." The places our guide took us we're abs beautiful and he seemed to know so much about the history of Ireland. "My favourite wow moment from our trip was being able to hold birds of prey at our second dinner together." Wonderful time. Stephen was a tremendous tour guide. So knowledgeable, funny, and relatable. Not a question was unanswered. I found myself having questions about a certain place, and instead of asking the museum tour guide, I'd ask Stephen! He always knew! Outstanding travel experience. We wanted to place our travel dreams in the best capable hands, particularly for our daughter's first time in Europe. The Heart of Ireland in 8 Days Tour did not disappoint. The result is a lifetime of unforgettable memories. 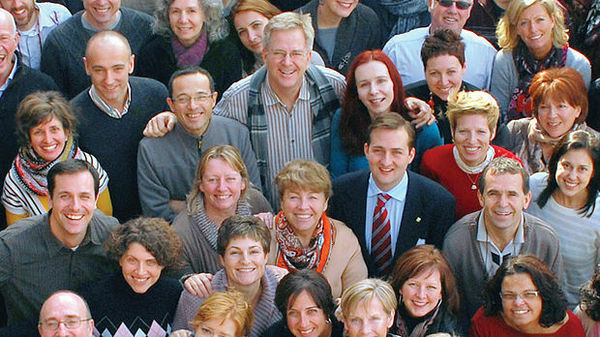 The Rick Steves team was first rate from start to finish. Absolutely magical! "Although we enjoyed each and every minute throughout the week, the Dingle Peninsula was my personal "wow" destination. The Slea Head drive provided some of the most breathtaking natural beauty anywhere in the world. I've traveled through seven other countries in Europe, and this was the single most outstanding experience for me." The tour was amazing. The sites that we went to were varied and extraordinary. Stephen was awesome and the history lessons he gave us daily really gave us context for the sites we were visiting. "Standing at the top of the Rock of Cashel looking over the entire valley and just feeling awe-inspired by all the history and importance of that site." I thoroughly enjoyed my Ireland trip. I would have never gotten to see or comprehend the significance of all the sites on my own. I enjoyed all the places we visited. Our tour guide and bus driver were the best. All the dinners provided by the tour were excellent. I have never done a tour before, but would definitely consider future tours. "I loved the birds of prey that we got to interact with at Stephen's Bed & Breakfast. The whiskey tasting was fun as well. I also loved holding and feeding the baby lambs. Another highlight was the evening with Seamus & his family singing, as well as watching the champion Irish dancer -- the Irish coffee served there was the best in Ireland." This was my first Rick Steves' tour and my husband and I had a great time. Along with 26 others we saw a beautiful country, had delicious food, and made great memories. I felt we had a great balance of structured activities and time to explore on our own. Our guide, Stephen, was extremely knowledgeable about Irish history which made the trip extra enjoyable. "For me, the countryside scenery was the wow moment. The Slea Head drive is beautiful! We were fortunate to be at Cliffs of Moher on a sunny, warm and windless day. That made for another wow moment." We had an amazing trip to Ireland with your Heart of Ireland tour. It was filled with so many memorable moments! We loved that it was a smaller group than other tour groups have, which made it easier to get to know each other. We also had an easy time staying together. I loved that we did the out of the way places, and did not go to the Blarney Castle. I also loved the way that it was all organized so nicely. It was an effortless trip - no driving, no getting lost! "There are too many to list them all! I loved Dingle, and wished we had spent more time here! I enjoyed the unexpected moments, like our time with the falcon expert, feeding the sheep, and time at Stephen's inn. I absolutely loved the boat trip around Dingle's harbor! It was breathtaking. And I loved the Blasket Island experience. I also enjoyed the singing on the bus and the stories!" I loved our itinerary and the fact the our guide did stick to it. I would have liked a little more down time in Dublin but that is minor. "The wow moments was the extra special things our guide did for us. The falconer, evening concert, arranging our visits to sites when they were less crowded. I know my wife enjoyed feeding the lambs." Fantastic tour. Breathtakingly beautiful country; record-breaking gorgeous weather; friendly, welcoming locals; fun, exciting and educational tour stops and local guides; a nice mix of open, interesting travelling companions; a smiling, helpful, professional bus driver; and the most amazing, funny, knowledgeable, gracious, personable tour guide ever. He was able to show us Ireland through his eyes with all his love and pride of his homeland. "Anything and everything on the Dingle peninsula was amazing. The beauty of the countryside, the boat cruise with the dolphin, the falconry at Stephen's home, the scrumptious dinner and hospitality at Milltown House; the quaint streets of Dingle, the dancing and music in the pubs and feeding the lambs. Perfect." "Dingle was so quaint, fun and very friendly"
I very much enjoyed the tour. I didn't know what to expect as I had never been on a guided tour like this before but it was very nice to have everything planned out for us and not have to make too many decisions. Ireland is a destination that my family and I have been wanting to go on for quite some time and it turned out to be a great choice to do it on a Rick Steves tour. We experienced the culture and it truly felt authentic. "I very much enjoyed the Dingle Peninsula. Learning about the Blasket community that I didn't know existed was amazing and also the falconry. To see those incredible birds up close and even hold them was something I will never forget." Our guide, Dara, made the entire experience great! If I had any complaints, it would be that we spent a lot of time traveling and didn't have much free time for exploring. "The music and Irish dancing in Dingle. Handling the birds of prey." This was our first time experiencing a group tour package, and we travelled with several other families. I was not sure what to expect, but was extremely pleased with the overall experience that was provided. It is obvious that customer satisfaction is a priority with your business, and that was a refreshing finding. Overall, it was a wonderful experience, with friendly staff and excellent accommodations. I would definitely book through Rick Steves' again for future trips of this nature. "There were many. First off, from the minute we walked in to the first meeting, Dara made us all feel welcome and comfortable. The experience with the bird handler was a wonderful surprise and was unexpected. The bird handler was very informative. I understand this was a new experiment with the package, and I highly recommend that you keep him as part of the overall package. The food served at all of the locations which was included with the package far exceeded my expectation. Great guide!" This was our first Rick Steves tour and our first trip overseas. We had an incredibly wonderful time. We had fun. We learned a lot about Irish culture and history. Our tour guide, Dara, was outstanding. The accommodations and food provided were generally excellent. It was an incredible experience even despite the two foggy dreary days in western Ireland. Brú na Bóinne, the falcon/owl/eagle experience, Dingle,and Glendalough were impressive experiences for the entire tour group. "The ancient tombs of Brú na Bóinne has to be my "wow" moment.Never heard of these tombs until we took the Heart of Ireland trip. How could you not be wowed standing in the exact spot that humans stood over 5,000 years ago. Much older than the Pyramids or Stonehenge. It's just a very small stone built domed area accessed through a very narrow and short stone lined passageway.People must have been much shorter and smaller 5,000 years ago! Very impressive construction. Falcon/owl event close 2nd." Dara was terrific! Pacing was comfortable and activities fun and informative. "The falconry experience and the two evenings of music and dance in Dingle." The tour exceeded all my expectations. My wife and I are not normally organized tour type people. So we where cautious about signing up for the tour to Ireland. After the first day we know we had done the right thing and it got better and better as the trip when on. Ending on a high note, we are ready to try another tour. "The trip to the Dingle Peninsula. What a beautiful place and everyone was so friendly and helpful." From the moment we began planning this experience until the very last breakfast on our departure morning, we were impressed by the attention to detail given to every aspect of this tour. As this was our first tour, we weren't quite sure what to expect. I must say that our Rick Steves' experience exceeded all preconceived notions that we held. Our guide, Dara, the accommodations, the food, the size of our group, our transportation, and activities were exceptional. "I absolutely loved the town of Dingle and its surrounding area. When I return to Ireland, it will be to this peninsula so that I may enjoy the countryside and the friendliness of the town and the Irish people." My experience was pretty close to perfect. The accommodations, the restaurants, the tours. and most importantly, our guide Dara Herlihy were outstanding. "That's a hard one for me. Just "being" in Ireland was a dream come true. I would say that the evenings we spent in Dingle were my favorite. Going to pubs, walking around and enjoying the town." I thought the tour was outstanding. Pascal was exceptional in every way. Except for the one night stay at the Club House Kilkenny, everything was perfect. "Probably the Cliffs of Moher or the drive along the Dingle Peninsula." I was hesitant to book a Europe tour. I was a little concerned I wouldn't find the structure and closeness to other travelers enjoyable but my concern never came to fruition. The tour was a remarkable experience. I attribute this to Pascal. He showed my wife and me more than we would have ever experienced if we had traveled through Ireland on our own. I particularly liked his entertaining and informative talks as we rode around the country. I learned so much about Ireland's culture. "I thought the stop in Listowel to eat lunch at John B. Keane's pub was a wonderfully memorable experience. The pub was a quaint local establishment that served us plates of ham, chicken, and veggie tea sandwiches while we listened to Billy, the owner, tell us what it was like growing up in the pub. The stories were a hilarious venture into Billy's special experiences. On this pub stop, we were able to experience the country's culture rather than just visit it." It was fantastic! My wife and I had a tremendous time and had a ton of fun. The entire trip was great and would do it again in a heartbeat. "The overall scenery, Ireland was such a beautiful place. Rapidly changing from place to place which gives it its charm." Most tour members arrange to fly into Shannon and out of Dublin ("multicity" on flight booking websites). 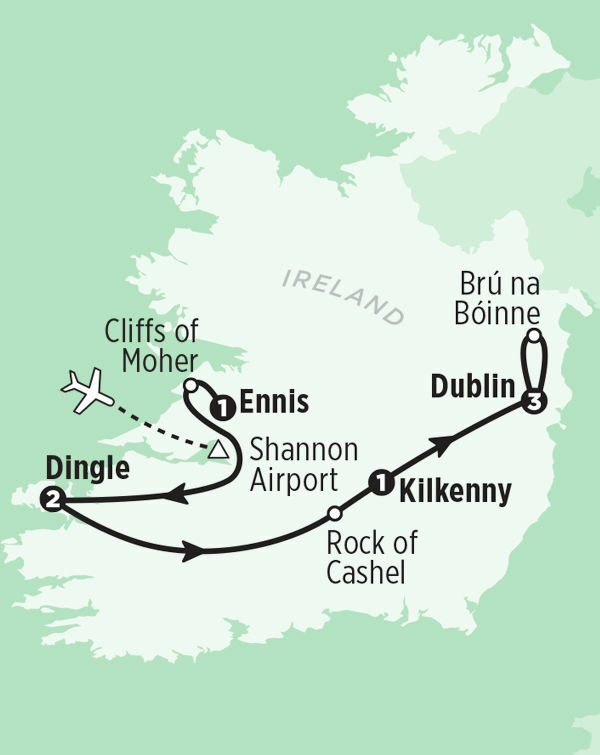 Ennis, where our tour starts, is an easy half-hour bus ride from Shannon Airport. Note: If you plan to spend a few days in the UK as part of your itinerary, you'll find a better selection of post-tour Dublin–London flights to choose from than pre-tour London–Shannon flights. We suggest arriving a day or two before your tour begins to allow ample time to get over jet lag and be well-rested for the first few days of your tour. For more information about transportation options for getting to and from your tour, see your Rick Steves Ireland guidebook.